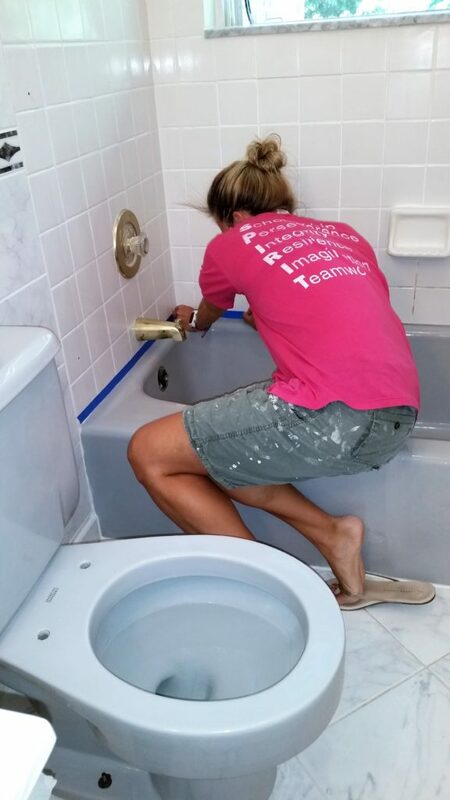 Painting a bathtub… and a toilet…and grout! Weird colored tub? That can be fixed! 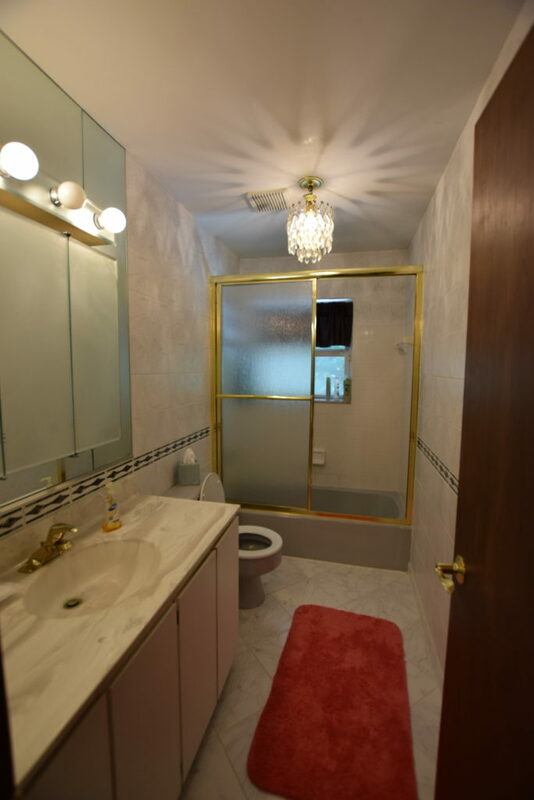 Before bathroom with grey toilet and tub and fancy gold shower door! Since I had no plans to totally gut this bathroom Plan A was to try and coat the tub in one of those specially formulated epoxy based paints for tub and tile. If it failed, then Plan B would be to rip out the tub and toilet. I’d heard good things from others who had done this project and read mixed reviews online but still felt it was worth a shot to potentially save over a thousand dollars and the sweat equity involved in replacing the tub and toilet. I first checked my local Home Depot and Lowe’s but both only carried a brand of tub coating that got terrible reviews. 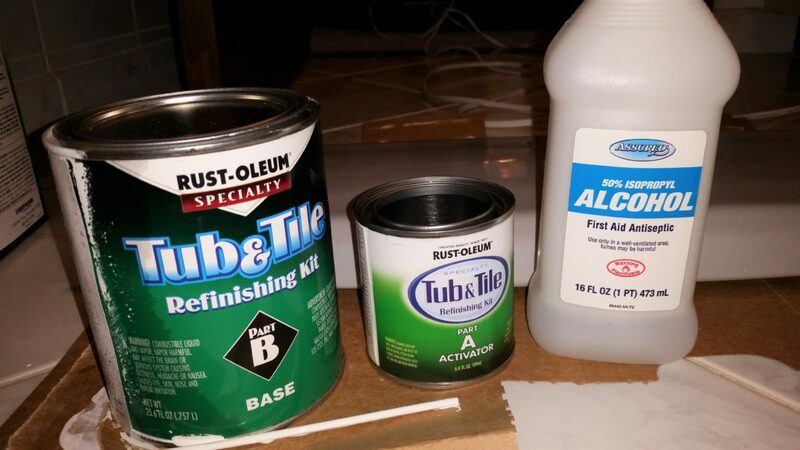 I bought Rustoleum Tub and Tile Refinisher (2 kits) on Amazon and it was at my house in 2 days. 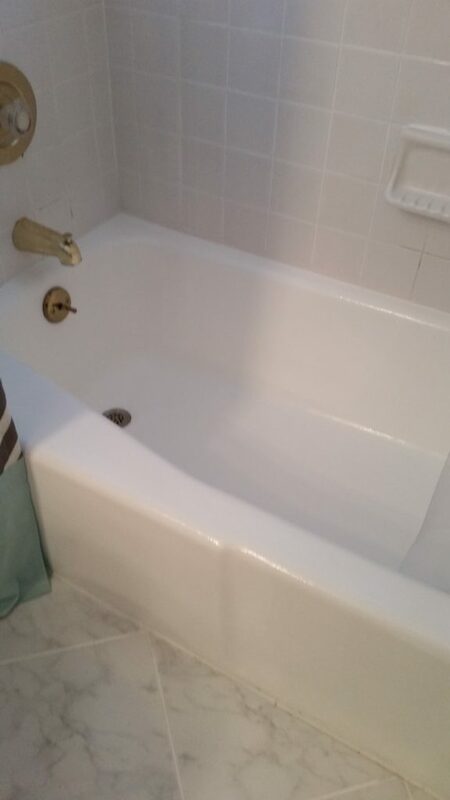 This is a high quality tub and tile paint. Rubbing alcohol can be used to clean up drips. First, I removed the gold shower doors and track. I planned on putting up a shower curtain afterwards. 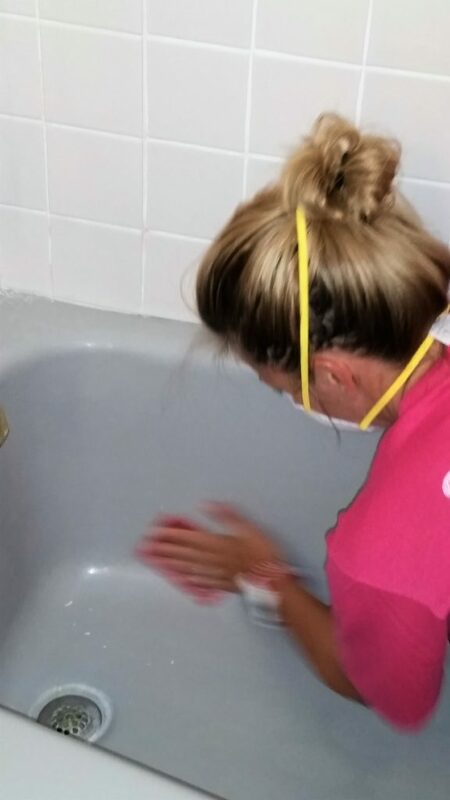 After they were unscrewed, I had to remove excess silicone from the tub lip and tile with a razor blade. 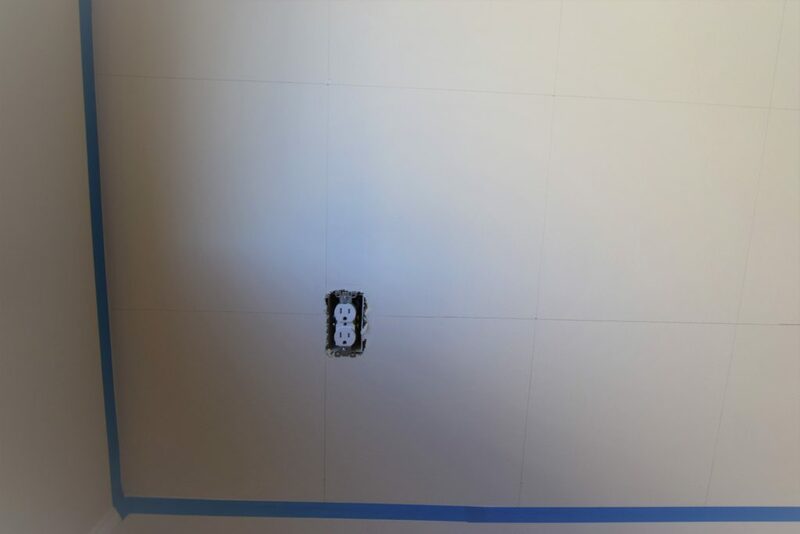 I also went back later and filled the holes where the track had been screwed into the tile with white caulk. 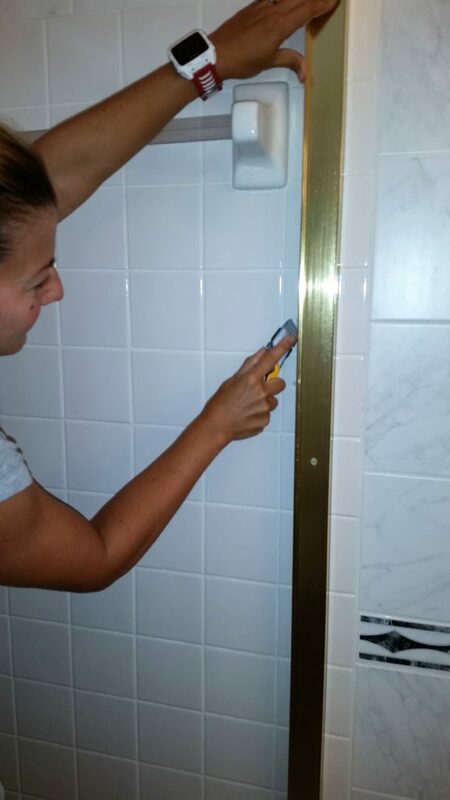 I also removed all the caulk between the tile and the tub and unscrewed the little brass drain doo-hickey. I didn’t bother removing the toilet handle deciding to make it white since most toilet handles these days are the same color as the toilet anyway. The toilet already had a new-ish white seat on it so I removed that. 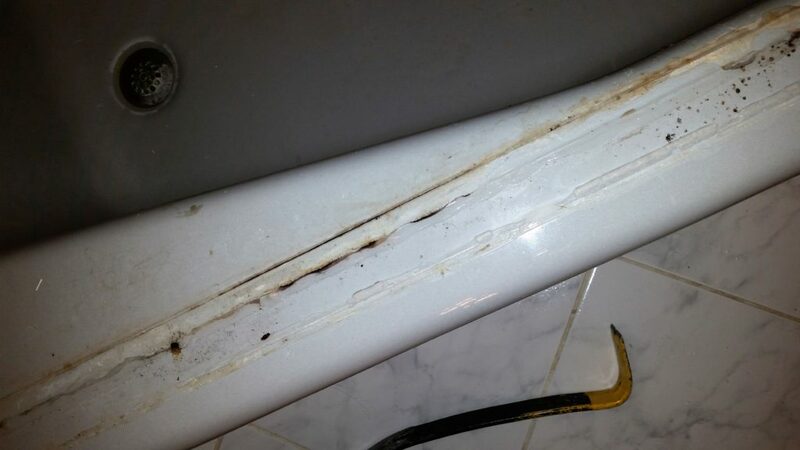 A utility knife can be used to remove the caulk or silicone between the shower doors rails and the tile. 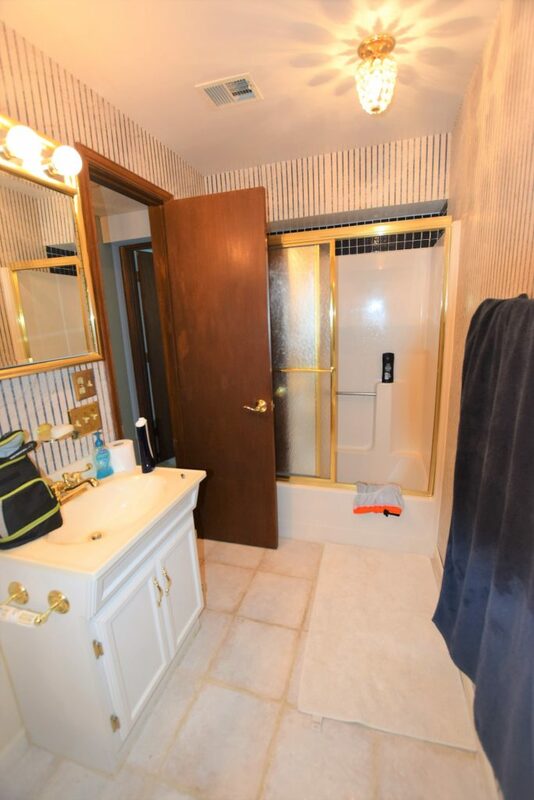 With the doors out of the way, I gave the area in and around the tub and toilet a really thorough cleaning with a bleach based cleaner in a lame attempt to remove lots of mildew and other nasty stuff. This is the gross crud that may be under a 30 year old shower door. Eww. This left me better able to see any other remnants of caulk or silicone that had to be removed around the entire tub. 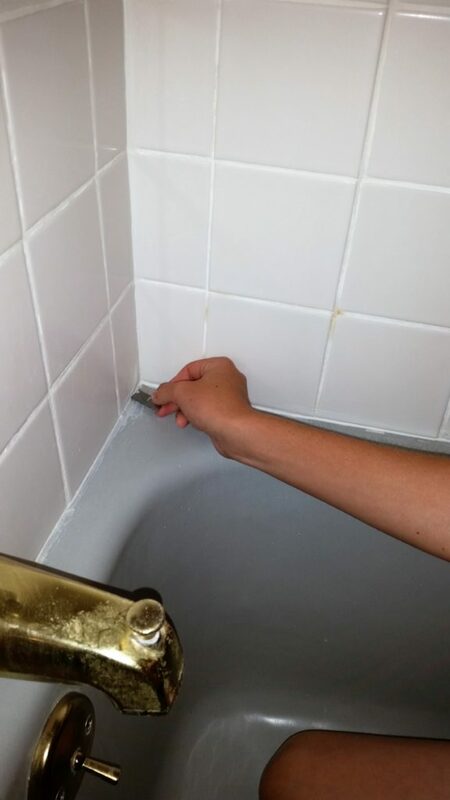 Scrape off old caulk with a razor blade. The paint won’t stick to caulk or silicone. Still there is a set of about 6 tiles with brownish yellow grout that I just could not get cleaned that will get new grout once I do other tiling, but these didn’t concern me too much since I didn’t want to paint the tile, only the tub and toilet. Next, I cleaned the tub and toilet with CLR. This was especially important because we have well water which generally has more minerals in it than city water and can leave residue on your tub. Regardless of your water source, do this step anyway. 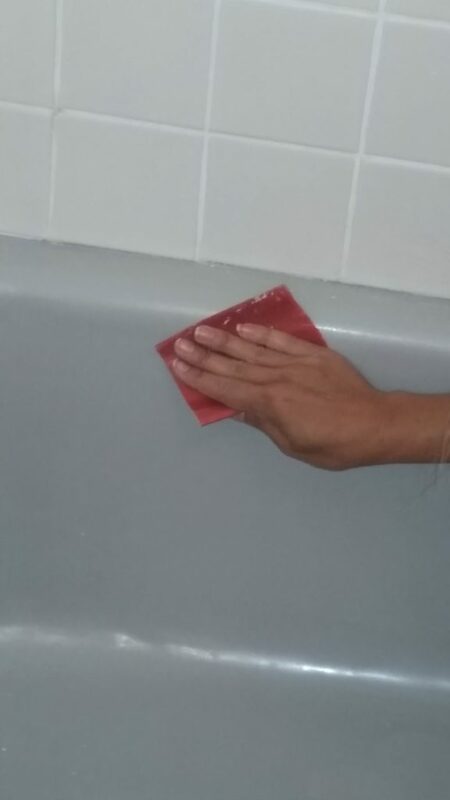 Your tub can’t be too clean for this process. Note, CLR, when used in a small space has fumes so wear a mask, open a window and turn on your bath fan for ventilation. After everything was clean, I sanded the tub and toilet with very fine grit sandpaper. I used a 400 grit. Then I rinsed with water, dried it, sanded and rinsed again. Sand the entire surface with a fine grit sandpaper to remove leftover scum and to slightly score the surface so it better accepts the paint. …and sand some more… keep sanding…. Once everything is totally dry and dust free you are ready to paint. It’ll be important to assess where you are in the process before you commit to painting. The special paint is an epoxy that comes in 2 parts. Once it’s mixed it must be used in 6 hours, after that it thickens to the point where it’s unusable. I opted to come back the next day ready to paint. I began day 2 by taking a tack cloth and running it over every surface to be painted to pick up any lint, dust, hair, and small particles that somehow magically appeared overnight. The surface must be perfect to accept the paint. I taped off the adjacent areas that weren’t going to get paint with blue painters tape. I followed Rustoleum’s directions and poured the contents of one container into the other and mixed them. The odors from this paint are noxious! Definitely wear a mask, open windows and put a fan or two on. No matter what you do it will permeate the whole house and linger for days, it’s that strong. I filled a disposable pan with some paint, soaked a fine nap roller made for smooth surfaces and started rolling. As advertised, the paint has unique self leveling properties… to a point. It is runny and will drip if you use too much so it’s better to use many thin coats rather than glob it on. Nobody wants a drippy tub. This stuff dries pretty quickly so if you find yourself overlapping an area you already did 5 minutes ago it may get tacky and not re-level so be careful of that. Just roll the paint right on in thin coats. I also noticed in areas where there once was silicone holding the door on it still didn’t adhere to even after scraping the silicone off, cleaning and sanding. In hindsight perhaps maybe using acetone might remove this residue, who knows? But since I had already started it was too late. I used the small foam brush in the corners where the tile met the tub and where the toilet met the floor. I removed the lid from the toilet tank so that I could cover the entire thing and also the tank itself. Now here’s where you might be wondering what I did inside the bowl which was also gray. I suppose I could have been all thorough-like and taken the toilet bowl water out in cupfuls then soaked up the last bits in rags, but nope, I didn’t. I just left it gray. And you might notice if the seat’s up and your looking right at it (sorry boys), but otherwise the eye is fooled into thinking it’s a shadow… at least that’s what I’m telling myself. 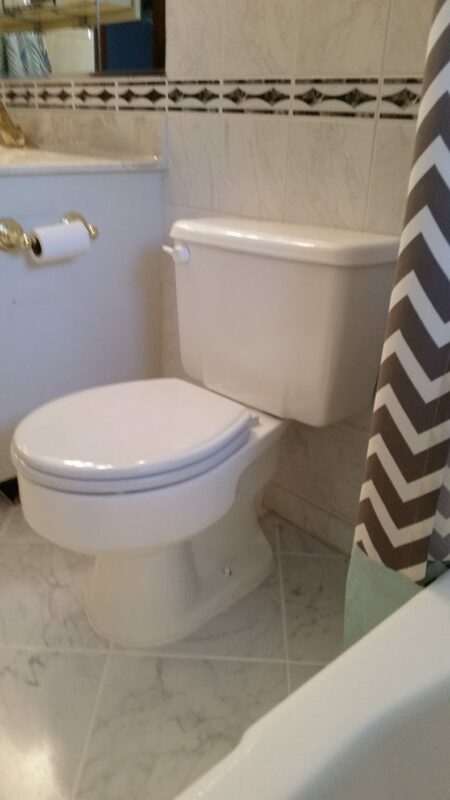 I was honestly a little paranoid about screwing the inside of it up then having to rip the toilet out altogether, which wouldn’t normally be a big deal but some moron grouted, yes, grouted the toilet to the floor – ugh. Anyway, 2 coats later and I could still see gray through, so I knew I was definitely doing a third. I decided to wait until the next day for more complete drying. 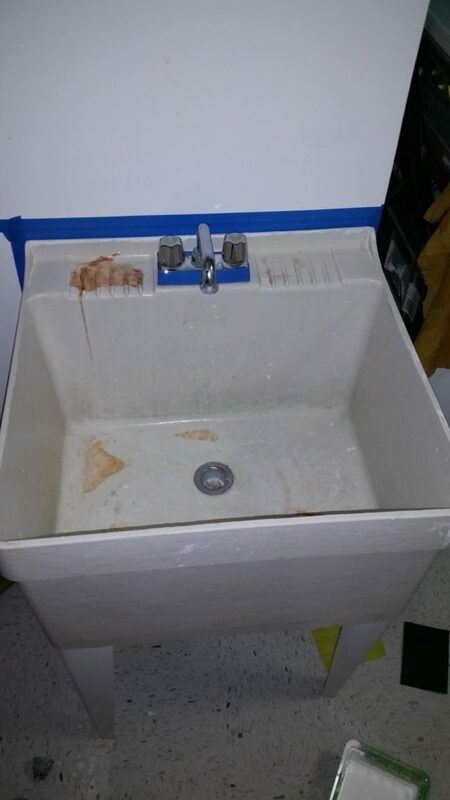 I used what little I had left in my paint pan to cover a nasty looking fiberglass slop sink in my laundry room. The tub and tile paint works on fiberglass too, like for this utility sink. This thing was so gross I wouldn’t have cleaned an old paint brush in it let alone laundry delicates (who am I kidding, I wash NOTHING by hand). Anyway, the slop sink looks brand new now. In between days 2 and 3 of this project is where I made my most critical mistake. I learned an old trick a few years ago that if you’re painting project will take you the course of several days then you put your brush or roller in a plastic bag, wrap it up tight and stick it in the fridge and the next time you paint it’s still perfect and fresh, not at all gunky or dried up. It can save you a ton of time cleaning brushes. Whatever you do DO NOT PUT THIS (or any epoxy, shellac or varnish based paint) in your fridge. Certain foods are very susceptible to odors and flavors that may escape the wrapped brush or roller and totally ruin your food. I learned this the hard way. I had an English Muffin the next morning with a little epoxy-butter. Yech. Butter itself isn’t healthy but chlorofluorocarbon laced butter is most certainly even worse for you. On day 3 of the tub project I mixed the second set of cans together to do coats 3 and 4 on the tub and toilet. (WARNING! Many a YouTube video will make this whole project look like it’s complete in mere hours, not days. Lies…all lies…unless one has nothing better to do that literally sit around and watch paint dry.) Anyway, after the third coat the silicone residue area on the rim of the tub was starting to get covered and accept the paint. With a 4th coat the paint was fully covering this area and for good measure I gave just this area a 5th coat. The tub (minus ugly gold hardware) looks like new! 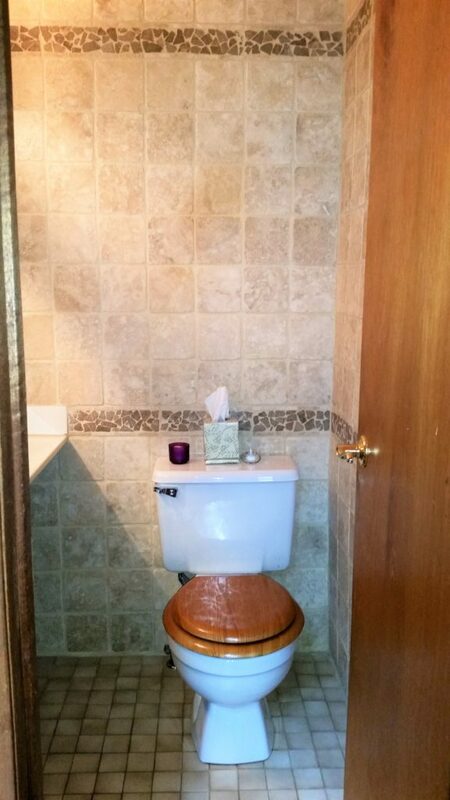 You’d never know this toilet used to be grey! I still had some paint left over so I racked my brain about what else I could epoxy-paint. And then, an epiphany! 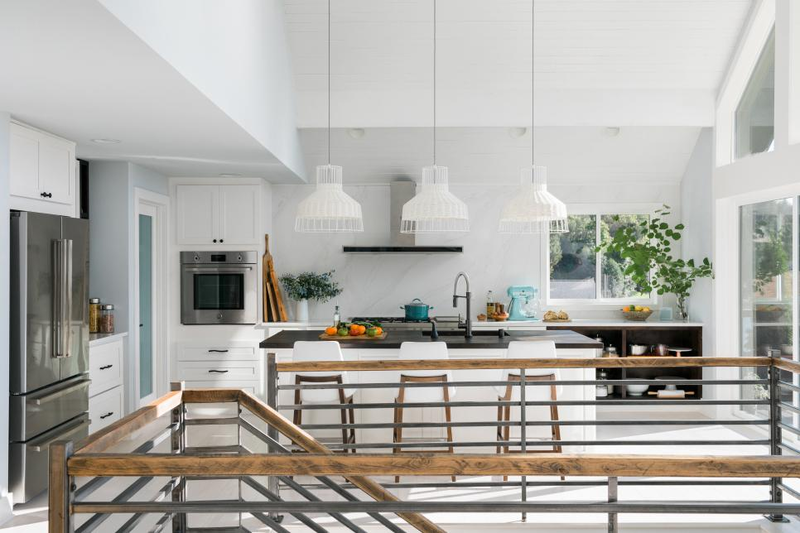 What is the bane of every awesome looking kitchen or bath that at some point WILL definitely go down the tubes and look like crap? Yep, the grout. I dunno what’s in that grout sealer they sell but I am convinced it’s a racket. Grout never stays clean. So it remains to be seen if this will last or not but I decided to paint the grout in between the bathroom floor tiles. Figured it couldn’t be any worse than the dingy dirty gray-brown that currently flanked the bright white and grey tiles. It was a bit tedious taping off each tile, but it seriously turned out better than I expected. 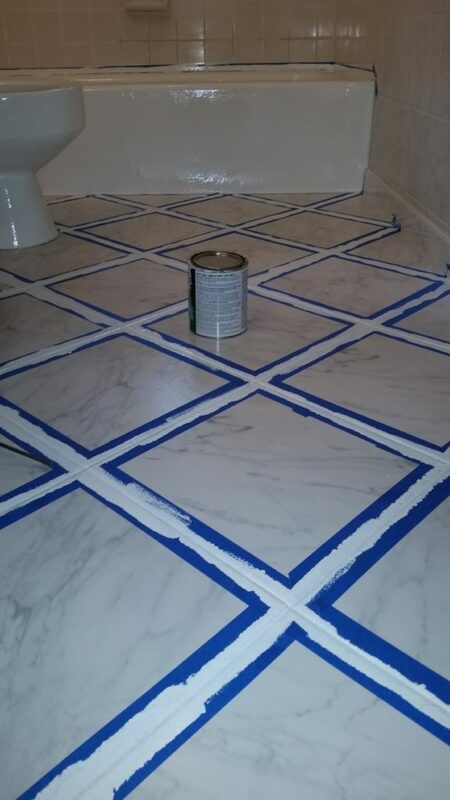 Use painters tape against any edge that you don’t want to get paint on while completely coating the grout in epoxy paint. I did 2 coats. All of the tub and tile paint has to cure for at least 72 hours before it can get wet and sustain foot traffic. I waited that long before I put back the toilet lid, the drain thingy, then I hung 2 tension rods at the ceiling one for a liner and one for my extra-long shower curtain. Hanging your shower curtain at the ceiling makes the room look taller! 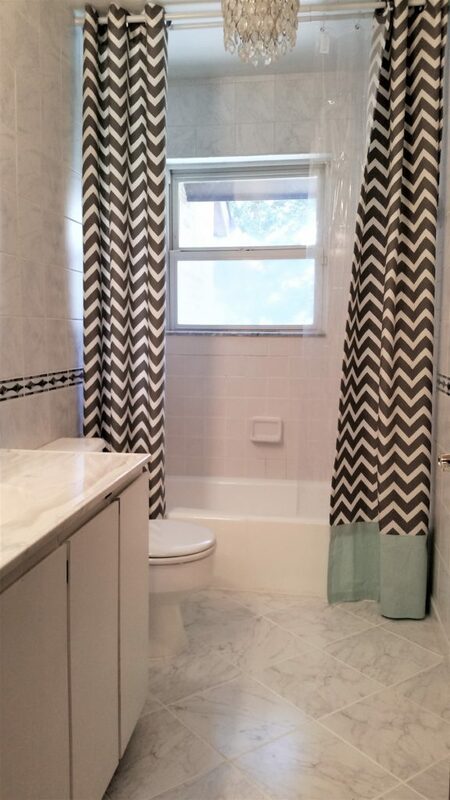 And yes, I know, I know the chevron print shower curtain is soooooooo 2016, but I had it leftover from my last house. I’ll change it when I update the rest of the bathroom. 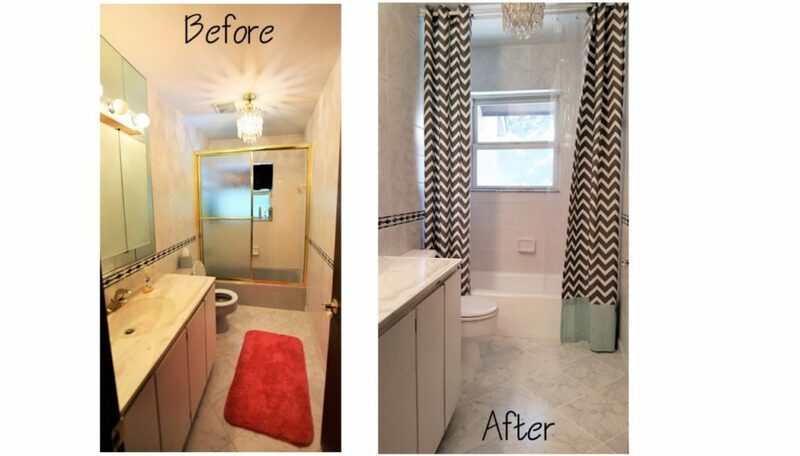 This bathroom is far from complete, but painting the tub, toilet and grout helped it a ton! It’s been almost 5 months since I painted the tub, toilet, laundry sink and tile grout and it all still looks great! Admittedly the finish isn’t as smooth as a regular tub, it’s a little dimpled, sort of like an orange peel, but it looks 100% better than having a dated bathroom ensemble. 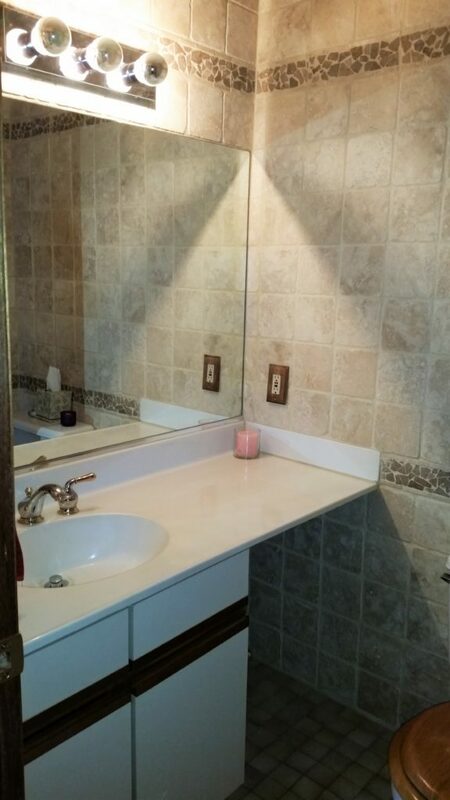 In the near future I’ll rip out the huge mirrored cabinet, fill the empty wall spaces left with remaining tile, and switch out the vanity and fixtures for something more current. So I’d not consider this photo a true “after” shot, but rather an interim. Now that we’re deep into the kitchen remodel and basement demo, it should only take me …. meh…. 3 years or so to get back to this project. Who’s hanging in there with me? Still a whirlwind here at my new home the construction site. Over the past weeks we had electricians moving several electrical panels from various places across the home to the garage. While this wasn’t an absolute necessity, we believe that it will pay off in the long run for two reasons. First, it will allow all wiring to be run in the basement in one new soffit right alongside the HVAC ducts. Previously the wires were a spaghetti mess above the drop ceiling in the basement, but since the basement ceiling is currently pulled out it made sense fix it properly now. 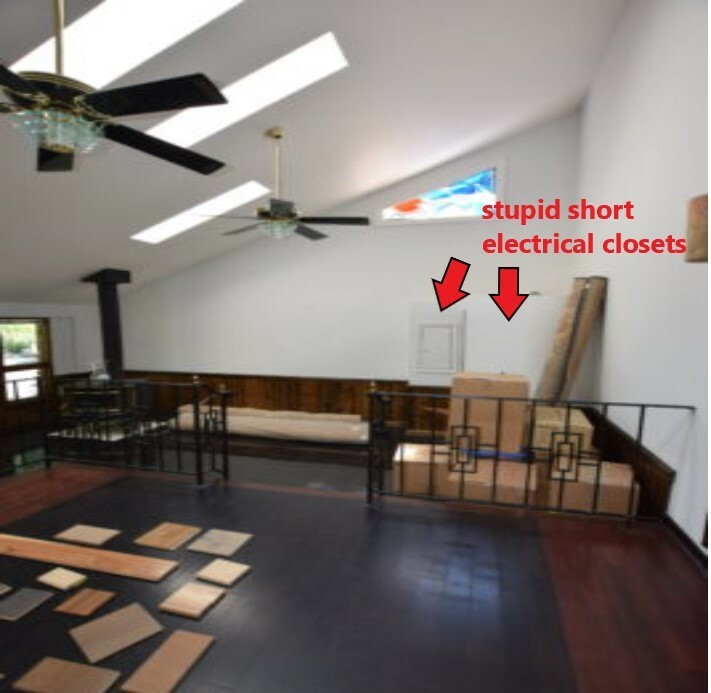 Second, it means we can remove both non-code compliant electrical “closets” that had been fashioned to hide the previous panels in the family room. While they technically did their job at hiding the panels, they were not aesthetically pleasing to look at and seriously messed with the flow and looks of the rooms. 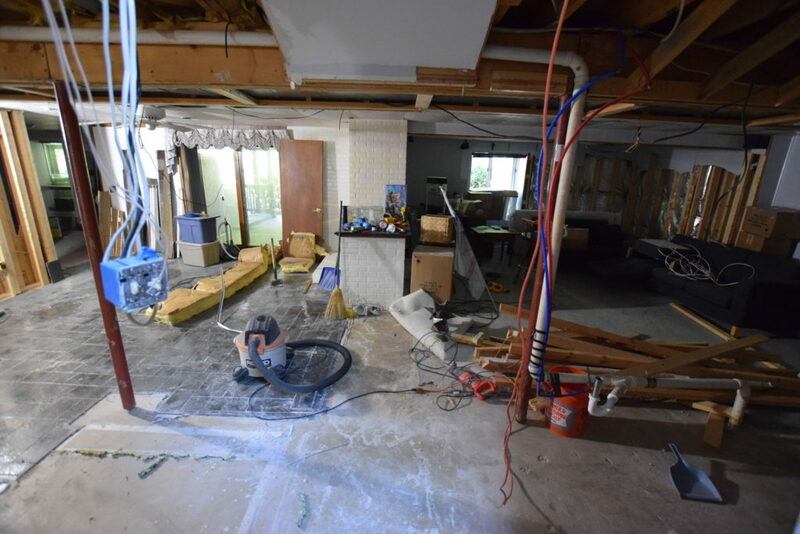 Other new developments include our receipt of a proposal to remove both loadbearing and non-loadbearing walls so we can rework the floorplan on the home’s main level. More to come on that soon! 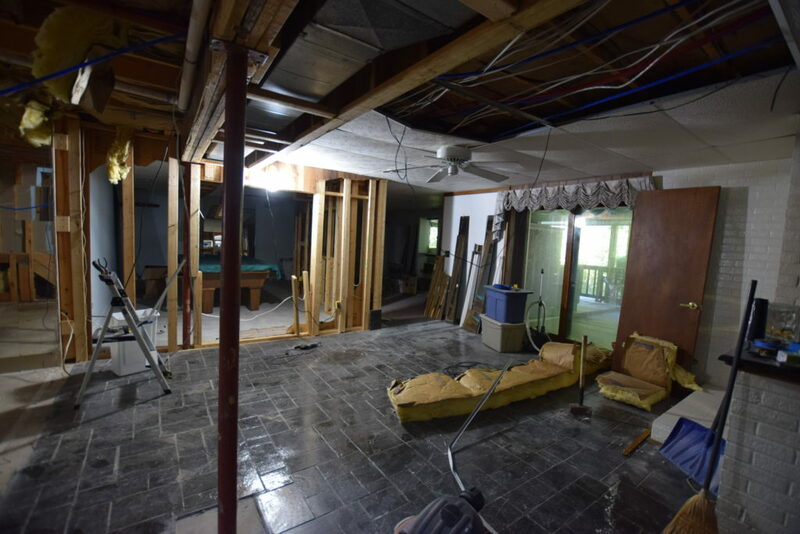 In the interim more deconstruction continues in the basement including continued removal of wood paneling, drop ceiling and carpet. Dead mouse count is up to 56! In addition to the removal of the walls, we’ve consulted with a plumber to talk about how to untangle the spaghetti of Pex plumbing that used to be in the basement drop ceiling, removal of the old wet bar drain, and how to ready the new kitchen area for plumbing including a gas line for the range (I’m hoping there is budget for a big professional grade range). I really wish we were further along than we currently are. Renovation always seems to be so much simpler and quicker in your mind than what reality dictates. HGTV makes it look so easy! I could maybe get a bit more done on our home reno if I wasn’t so busy with design projects for my business, but this is a problem I can’t complain about! Here’s a recent project that I wanted to share. I recently did a custom geometric mural painting for a client’s new home. Their son is a huge Minecraft fanatic. 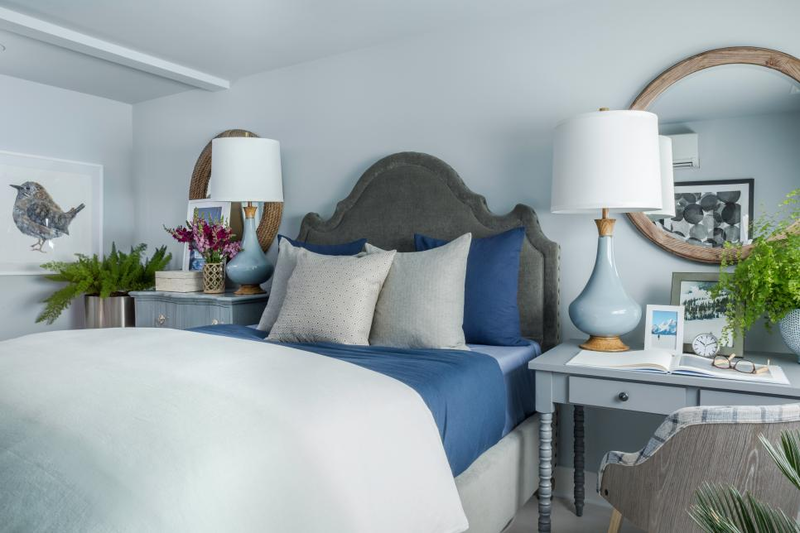 Rather than pick one paint color for his bedroom, I proposed 12 colors! That’s right, TWELVE, that take the shape of that tell-tale Minecraft cube pattern. 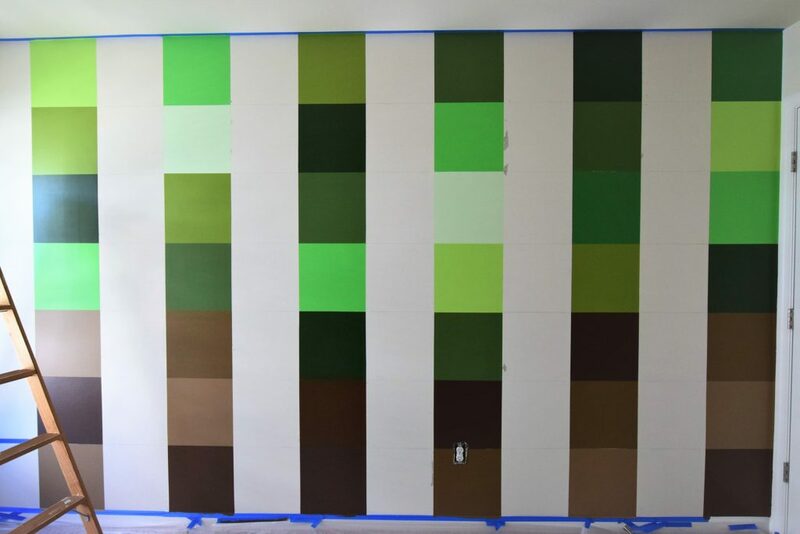 All 12 colors were in the shades of green and brown and when finished have the look of Minecraft dirt and grass. The great thing about this geometric mural is that it could be done in a variety of colors depending on what your child likes most about the game. Shades of grey for rock, grey and black and spots of red for spider, shades of blue for water, you get the idea. It’s actually pretty easy to recreate with a little patience, skilled use of a level and lots, scratch that, TONS of painter’s tape. Drop cloths, paper towels, rags, etc. 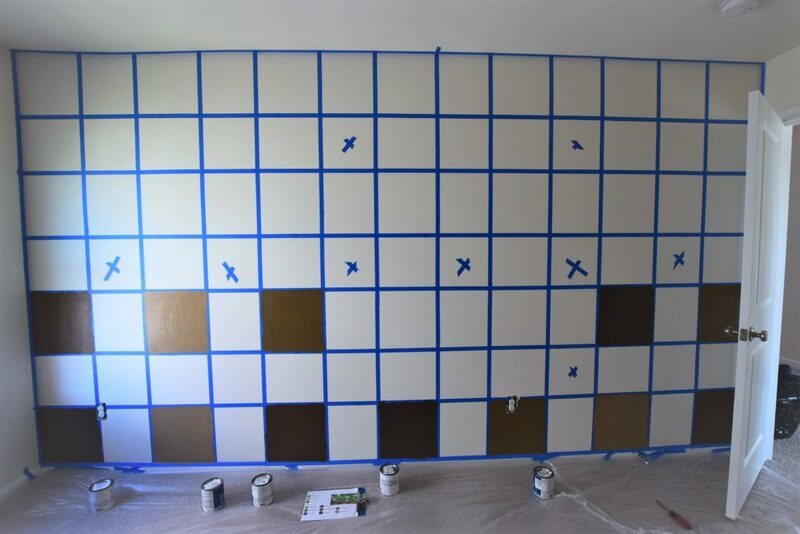 First, I needed to determine how many squares I could fit across and vertically on the wall so that I didn’t end up with partial blocks on any edge. To start with, I knew that I wanted large-ish blocks that were about 12 x 12 inches each. So I took the overall length and height of the wall and divided by different figures until I ended up with something that was evenly divisible in both directions. In this case it meant blocks that were about 13 x 13. Is there likely a mathematical proportional equation that could have figured this out the “right” way, sure probably, but this way just seemed logical in my head, so that’s what I did. Start with a boring white wall. Once I knew how large each block would be I took my yardstick and measured every 13 inches along the bottom of the wall and made a small pencil tick mark. I did the same thing going up the left and right sides and along the top. Then, I took my level and made intermediate horizontal tick marks 1/3 up the wall and 2/3 up the wall. Next, I used the level to connect the dots to make a perfectly straight grid pattern both horizontally and vertically. 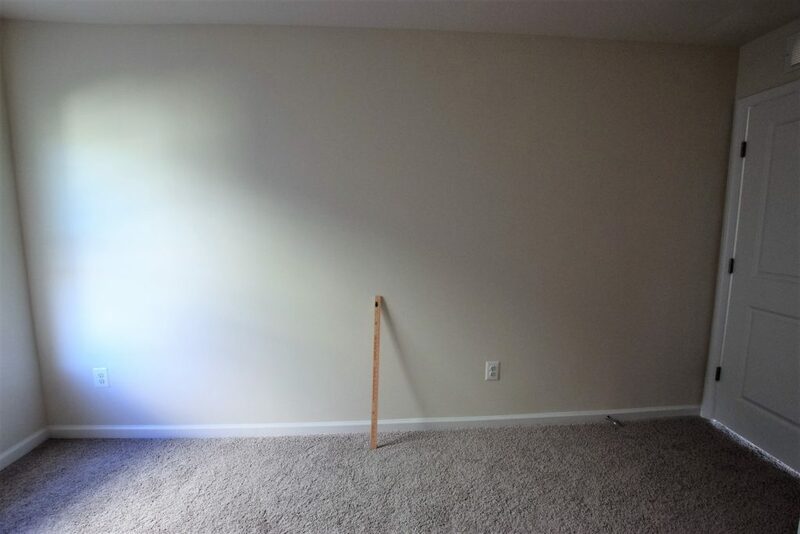 Everyone knows homes’ walls are never perfectly straight, so every now and then I’d step back to make sure it looked about right. Next, it was time to tape. I began with taping on the ceiling, baseboards and the adjoining walls first since those pieces of tape will stay put for the entire project. Then I began taping on the left edge of each vertical line and on the top edge of each horizontal line. 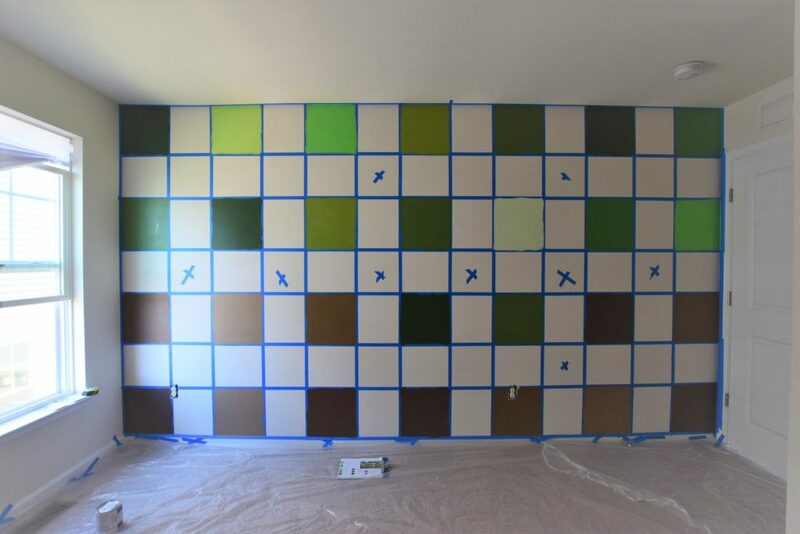 Because of where you have to tape, at any given point you can only paint a quarter of the wall’s squares. 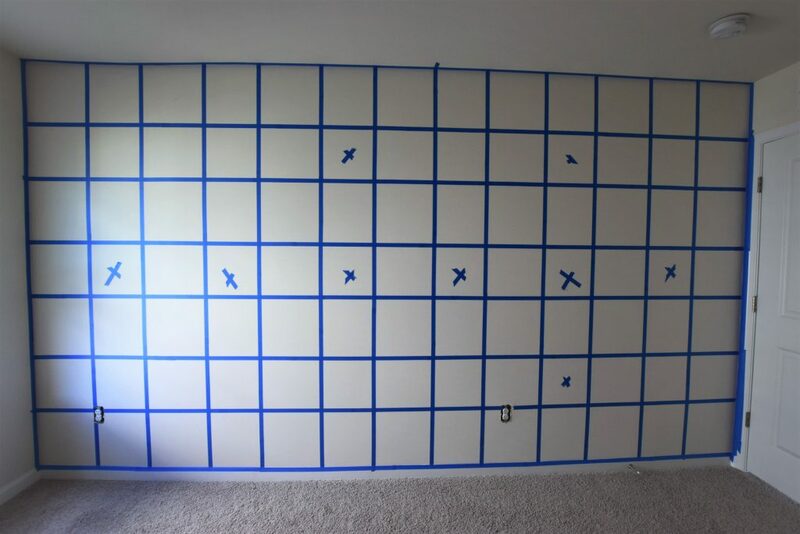 Starting off because the squares looked so similar (everything white with blue painter’s tape) I placed some blue tape “x’s” on the squares I should NOT paint so I could keep track. In the current formation I painted every other bottom square, every other square on the 3rd row, 5th row, and so on. I didn’t use a specific pattern for where to put what colors, but had a few rules I followed to keep it looking like true Minecraft. I kept the bottom 2 rows completely brown. 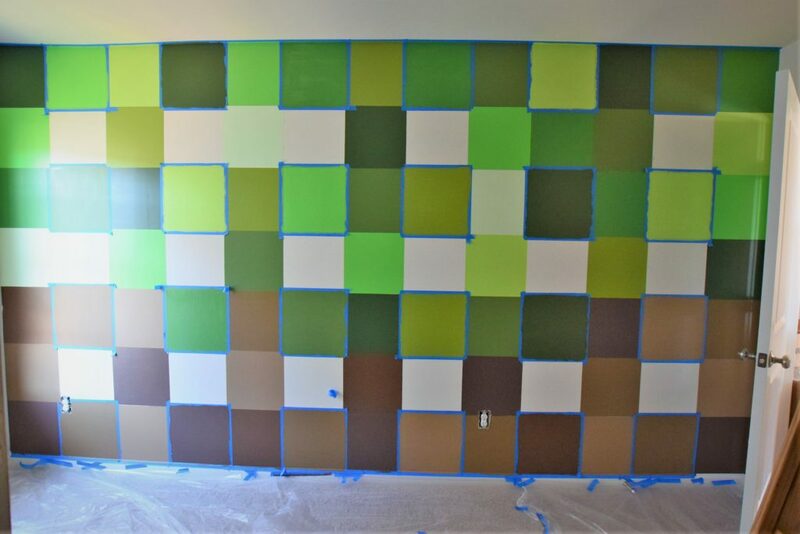 The third row from the baseboard was a mix of brown and green and the rest of the cubes above that third row were green. I never put the same exact color directly adjacent to itself. The same color diagonally was acceptable. Tape off the squares and mark a few so you know which ones NOT to paint. After my first coat was dry I went back and gave a 2nd coat to those squares then removed the tape. I used a brush to do all of this painting for a few reasons. Brushes, while they required a slower and more methodical stroke, minimized bleeding under the tape. Also, utilizing 12 different mini rollers and pans could get expensive and unwieldy. Every time I finished with a brush, I’d return it to its own plastic bag to keep the paint moist. 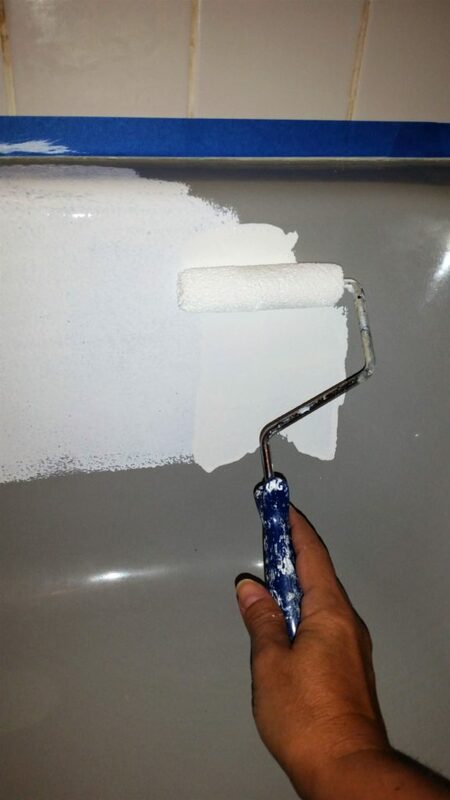 Hint: If you have a painting project that will take more than 1 day place your brush or roller in a plastic bag, seal it, then put it in the fridge overnight. Only do this with latex paints. Other more odious products can ruin food. Believe me, I know firsthand. Once the first set of cubes was completely dry, I re-taped on the opposite edges and painted the isolated squares with 2 coats, then removed tape, let dry, and re-taped. I repeated this process until all squares were completely painted. Inevitably there were some areas where either the paint bled under tape or the tape overlapped too much leaving white to shine through. I had to go back and touch up these areas with a small detail brush. 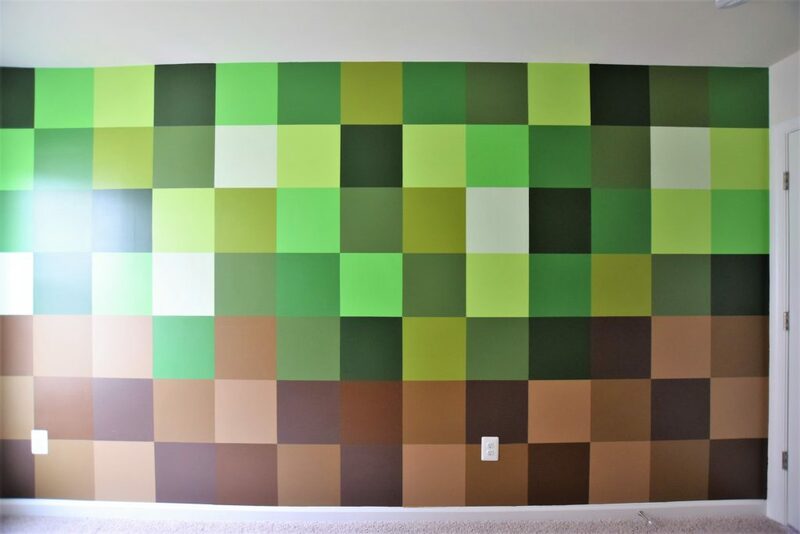 Finally, I removed all the border tape along the ceiling and baseboards, and voila, Minecraft wall accomplished! This project took about 2.5 days to complete. It helps to be able to ventilate the room with fresh air provided it’s not humid or raining outside and a fan to help speed up the drying time between tapings. Remove tape and then re-tape in next area. Getting closer – be patient! Ensure that same colors aren’t adjacent. 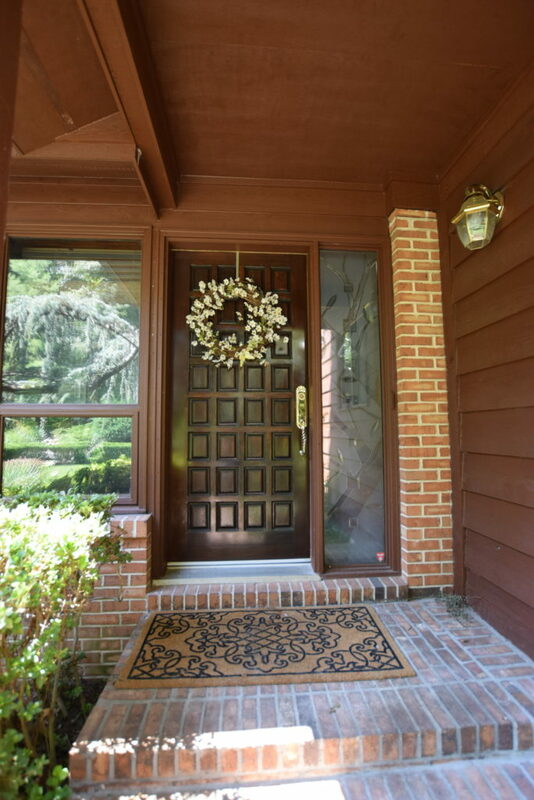 The finished product – adds dimension and interest. 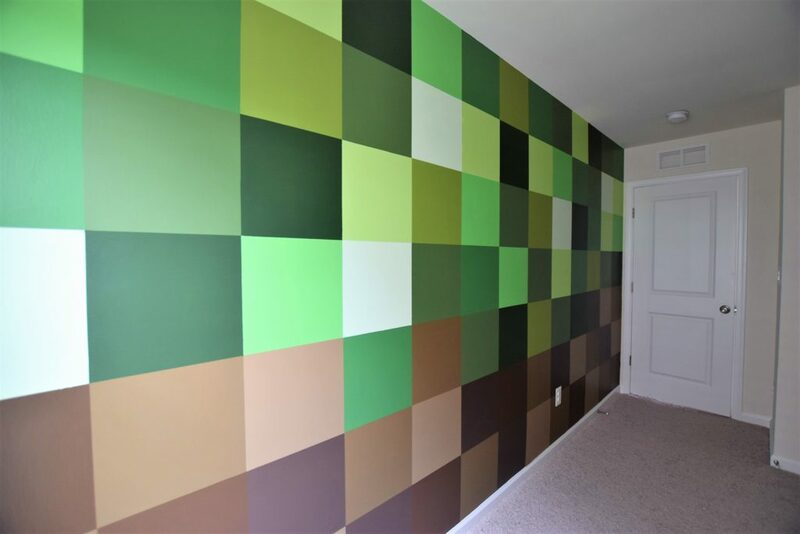 The perfect wall of Minecraft cubes! Back in Business! And Demo Day! Ok, I had a serious moment (truthfully, it was a long moment… like several days long) of panic last week. I had heard that subscribers weren’t getting emails of my blog posts, so I set about trying to rectify this issue and found that all of the blog’s subscribers had vanished! Yikes! I noticed a few other website issues too. After lots of time on the phone and in chat with the help desk from my hosting company (who, um, weren’t so helpful), and then more time tinkering myself, I finally figured out how to fix it. Phew, HUGE sigh of relief! So my fingers are crossed that all of my subscribers are reading this via the link sent to their email. I “think” we’re back in business! Anyway, I wanted to update you all on the progress here at my house renovation. 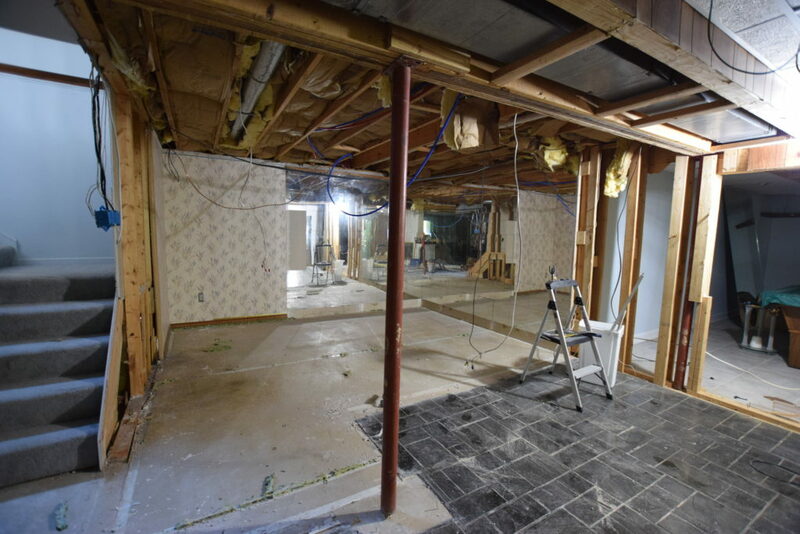 I would technically not consider anything we’ve done so far as “renovation.” Let’s be honest, it’s all still demo. This will continue to be the case for a while. It feels never-ending. It’s definitely not as fast nor as fun as ‘ol Chip Gaines makes it look on Fixer Upper! Every weekend we continue to tear out old paneling, mirrors, drywall, carpet and drop ceiling in the basement. We are also trying desperately to track all the electrical and make sense of what had been done previously. The entire drop ceiling is a mess of wires that we aim to nicely package in one existing soffit so we don’t have to do a drop ceiling again, cause let’s face it, drop ceilings in an already low basement are no bueno. 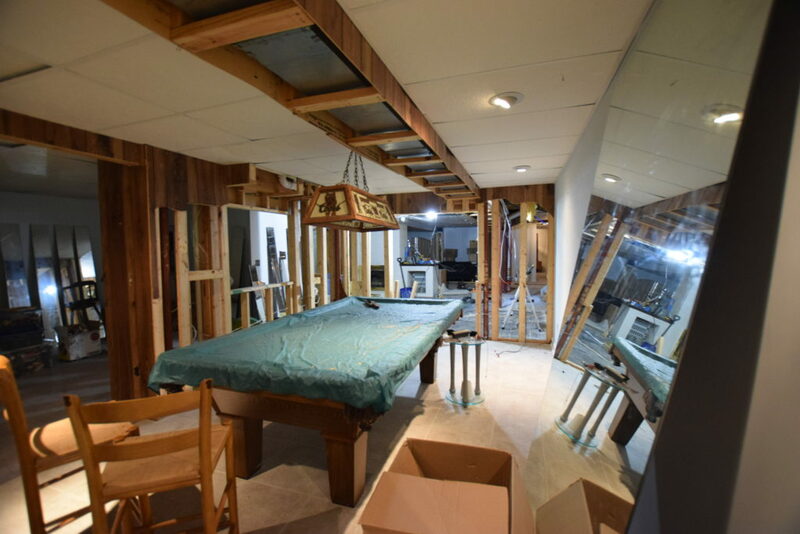 Ultimately, given the current state of the basement, we’d probably have been better off if the basement hadn’t been finished in the first place. When the home was inspected we saw that the ceiling of the basement was insulated (which isn’t required) so we thought it was a real plus. Well, now we have to rip it all out. Why? Because it’s made a nice cushion-y bed/ graveyard for mice. As we pull out walls and ceiling and insulation we’ve come across 44 mice (all dead) so far and a TON of mouse poop. We’ve also found some black mold on the western wall sheetrock so even though we weren’t planning on ripping that drywall out, now we must. I’ve put out a few more traps in case there are any surviving mice and once demo is complete will probably have a pest control company come in to close up any possible points of entry. In the mean time we’ll keep the dead-mouse-tracker going and continue to be skeeved out. 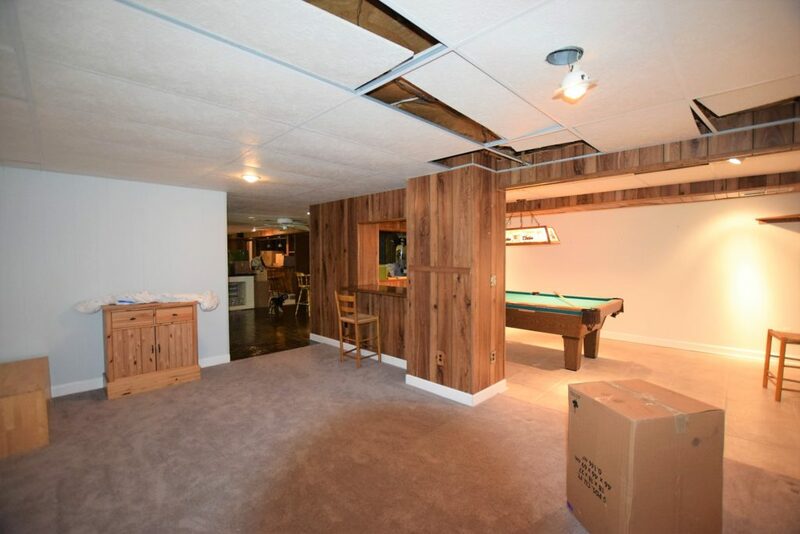 This basement demo has been riddled with issues, but already it looks so much better. It’s much more open and airy. It feels like a larger and more usable space. Here’s a few progress pics. And if anyone has a surefire way to rid a house of mice once and for all I’m all ears. And yes, I plan on dropping about a grand at the container store to finally get the Pinterest perfect pantry complete with pretty mouse-proof glass containers for all of my flour, cereal, pasta, et cetera. For the peace of mind that I am certainly eating mouse poop free Cheerios, I think it’s worth it. 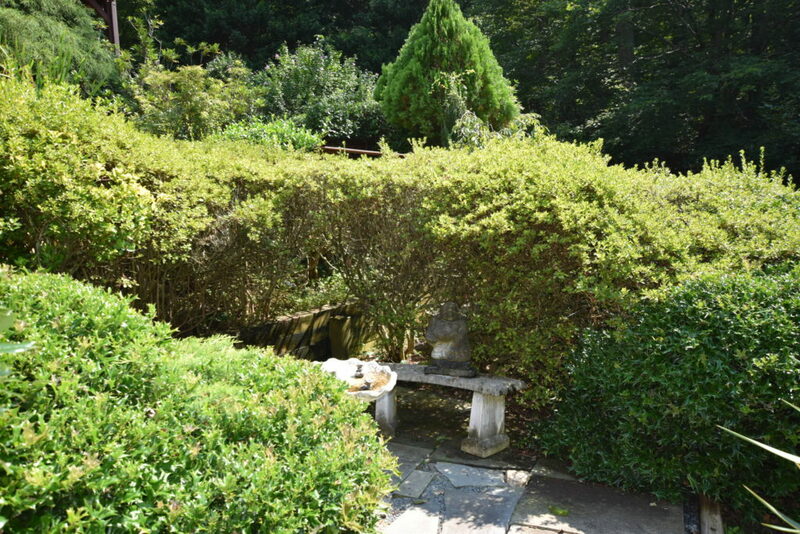 These 5 sublime wooded acres outside Washington DC are the reason we bought this… ahem… less than ideal house. I may have mentioned that our last house, though it served us well, was crammed with hundreds of other houses in a community of tract homes. All of the homes looked similar and we were literally less than 6 feet from our neighbor’s home. While we enjoyed our old community amenities, like a pool and a small gym, but we longed to have our own private versions of these perks. Oh, and we also had one more not so exciting desire, a 3-car garage. We don’t have 3 cars but we have accumulated some fun toys like a jet ski, a kayak, and my husband has a grown-up Lego, a Jeep, which has parts that go on and come off routinely. 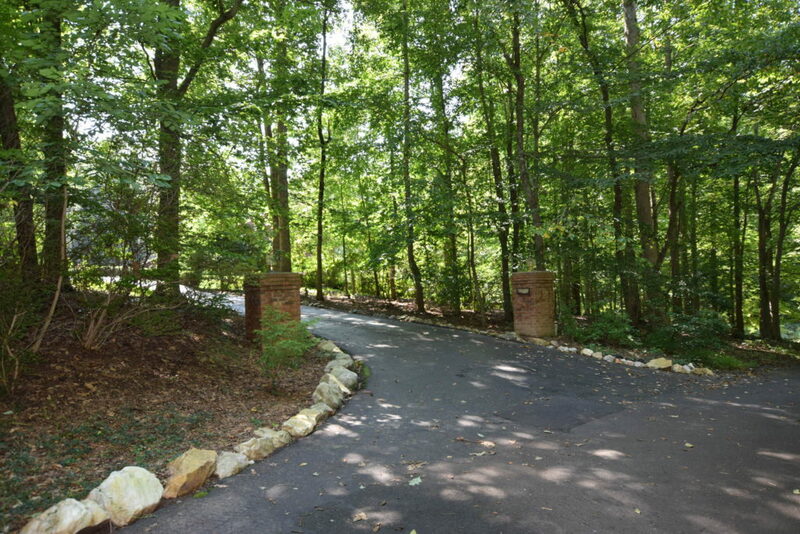 This land is lush and extensive and surrounds this contemporary home just perfectly. Check it out. 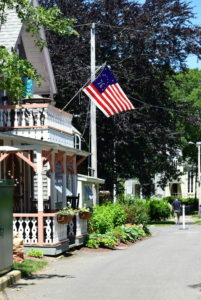 Our new house is on a quiet street. I cannot hear traffic noise from my home, just the sound of bugs, birds and frogs. Each home on our street has several acres so when the leaves are on the trees I cannot even see my neighbors. Time will tell how much we will be able to see them as the leaves fall off the trees this autumn. The house is at the end of a street with no outlet which means even more privacy. Most of the 5 acres are woods. 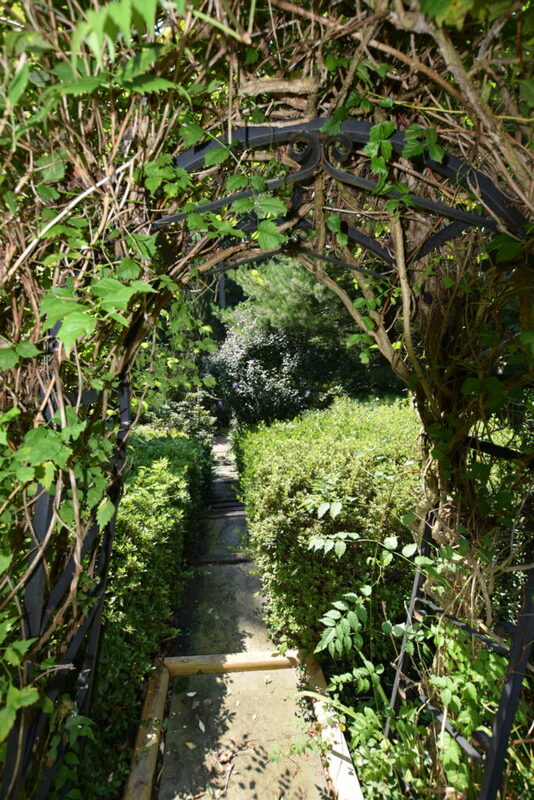 One side of the property is bordered by a bridle trail – yes – some people in this area keep horses on their property! 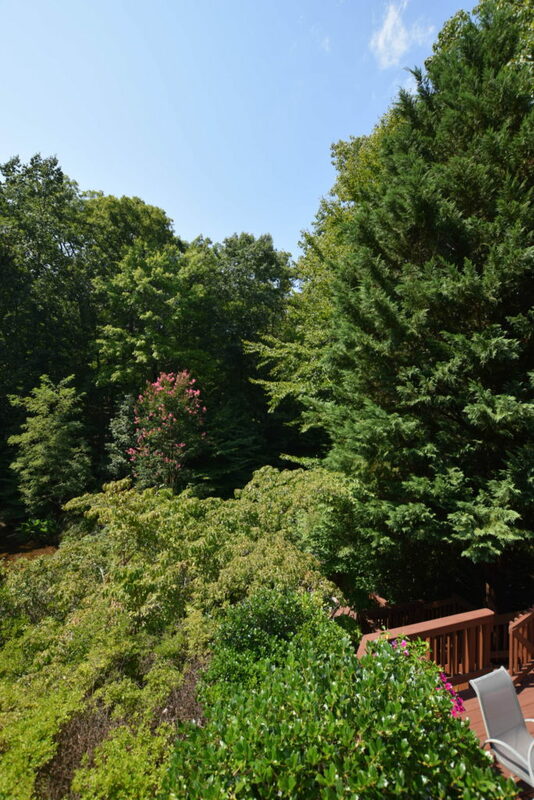 There’s probably less than half-acre of our yard property that is mow-able grass but the plants, gardens, ponds and waterfalls are plentiful, so we will have a significant amount of landscaping to keep up with. 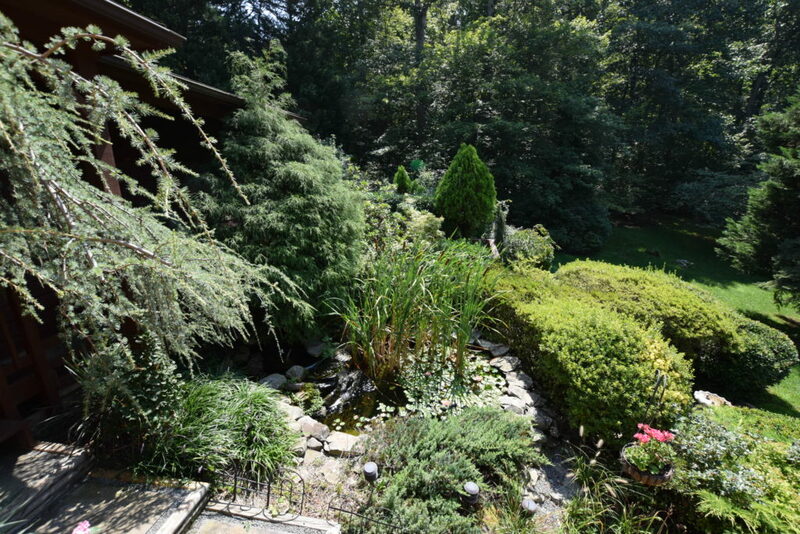 There are 2 large ponds, 2 small ponds a wooden footbridge, a land bridge, and 3 man-made waterfalls. 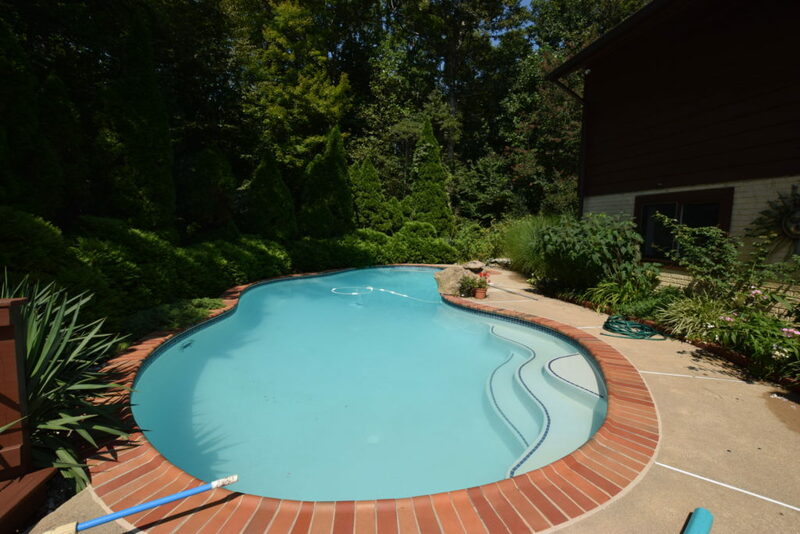 The house also has various levels of decks and patios including the one that surrounds the free-form shaped pool. 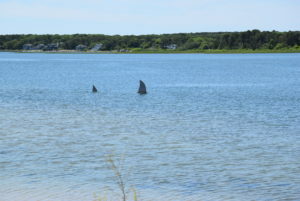 In this county, installing a pool can be really expensive, especially on a sloped lot like this one. It’s one of the major reasons we selected this house. 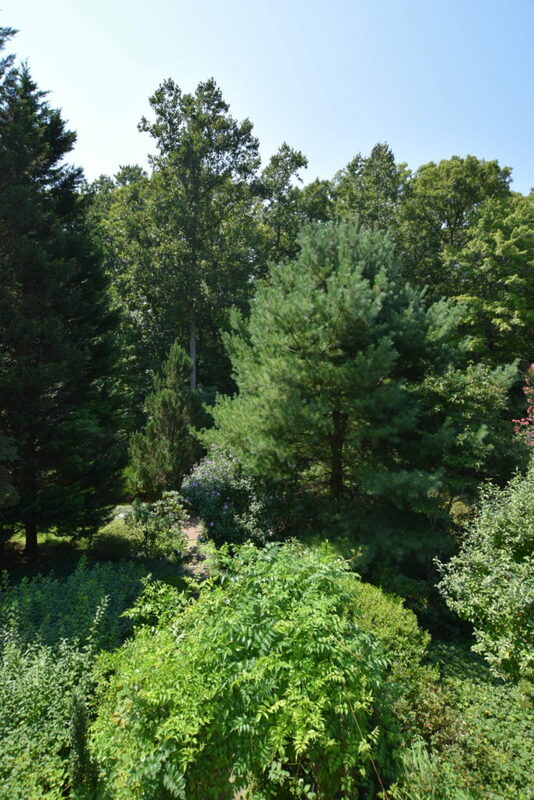 The trees and plants are plentiful and wide-ranging. 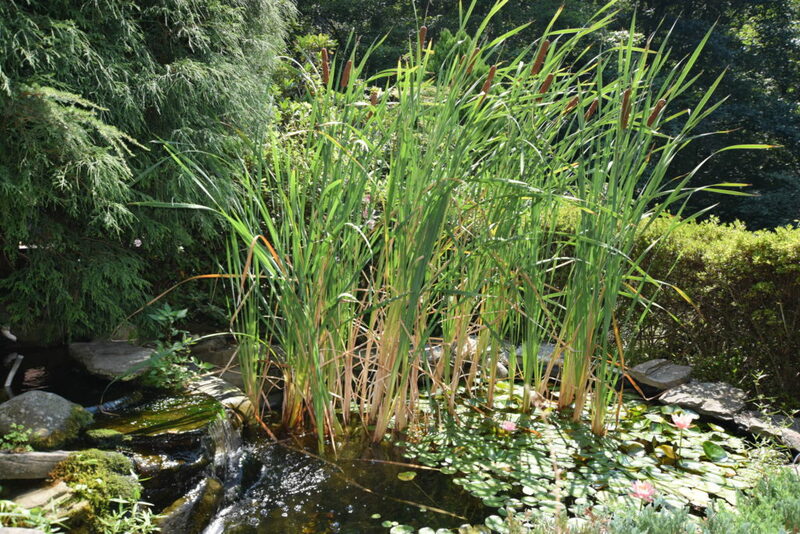 We have a variety of pines, oak, boxwoods, azaleas, yucca, ivy, juniper, ferns and even flowering waterlilies. The learning curve for caring for all of these plants is huge, but a fun challenge. I look forward to one day erecting a small greenhouse and growing veggies or maybe figuring out how to capitalize on the 4 ponds for hydroponics. 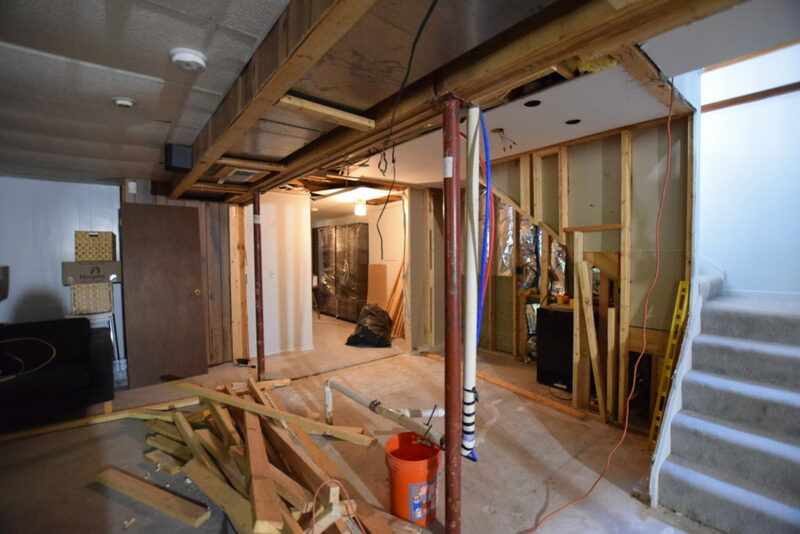 We’ve already started opening up some walls so we can see some of the supporting structures and ultimately adequately determine how to safely remove some walls. Next week see more of our demo! 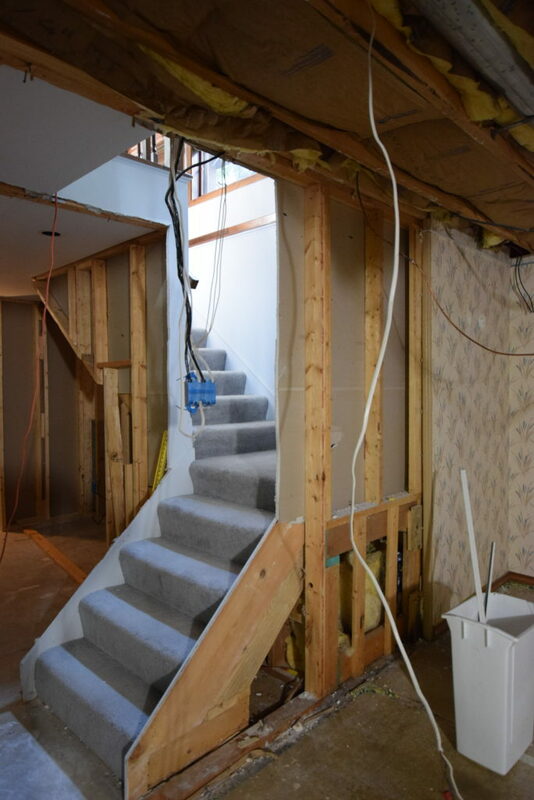 In the last post I took you through the main level of our big renovation adventure, “before edition”. Today I’d like to take you through the downstairs. Well, actually, I don’t want to, because it’s a bit embarrassing. 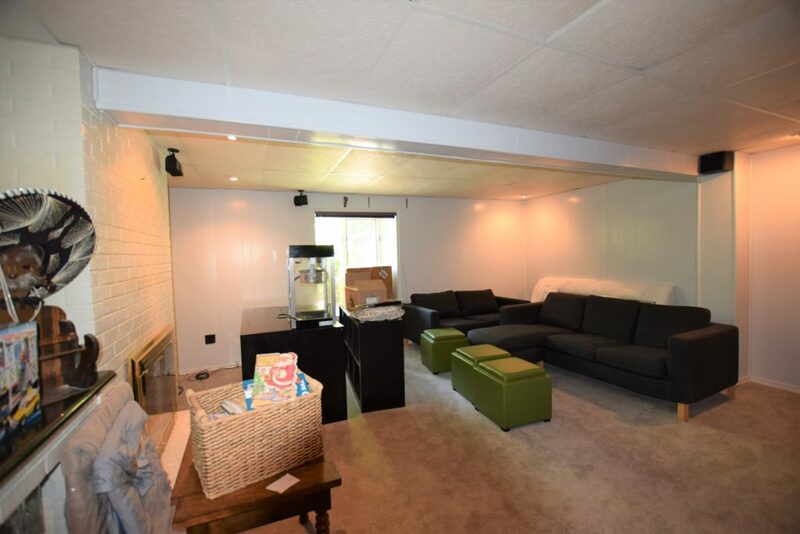 It’s the basement level of our 5200 sq foot house and the basement is just as long and rambling as the upstairs. Right now it’s filled with moving boxes and furnishings scattered aimlessly. 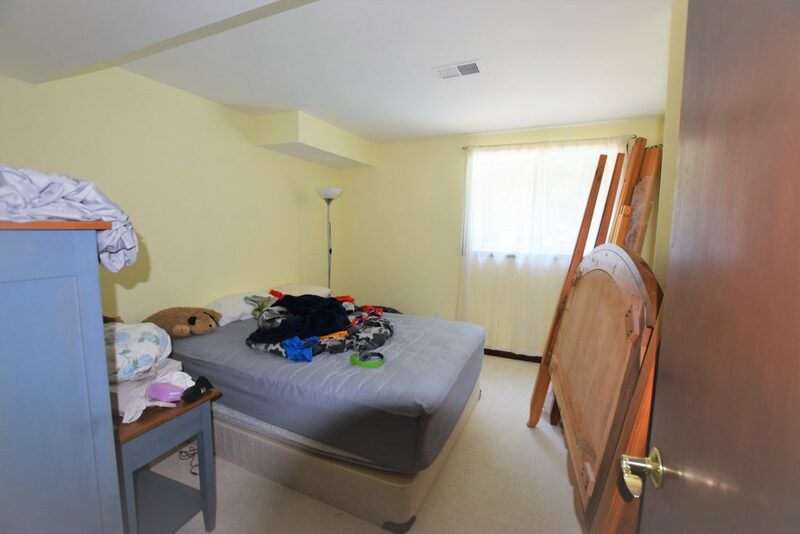 Our justification for this helter-skelter appearance is, “Why bother to take a ton of effort in establishing this space as livable rooms since so much of it will get renovated?” Maybe this is lazy, but we’re saying it’s practical. So hold on to your hats for this messy tour. 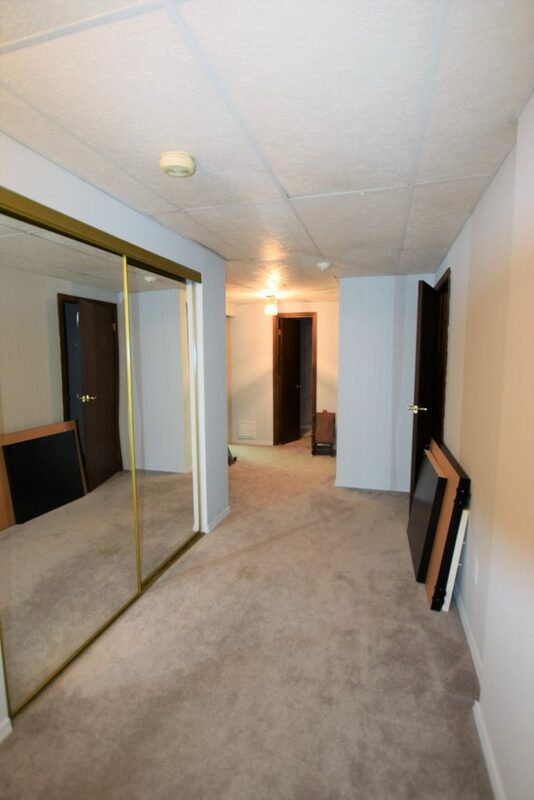 The 2 really great things about this basement are that a) one side is completely at ground level, so we have full sized windows and doors, rather than those mini basement windows and b) the basement stretches the full length of the house. You can enter this level right from the foyer, which is a little odd. 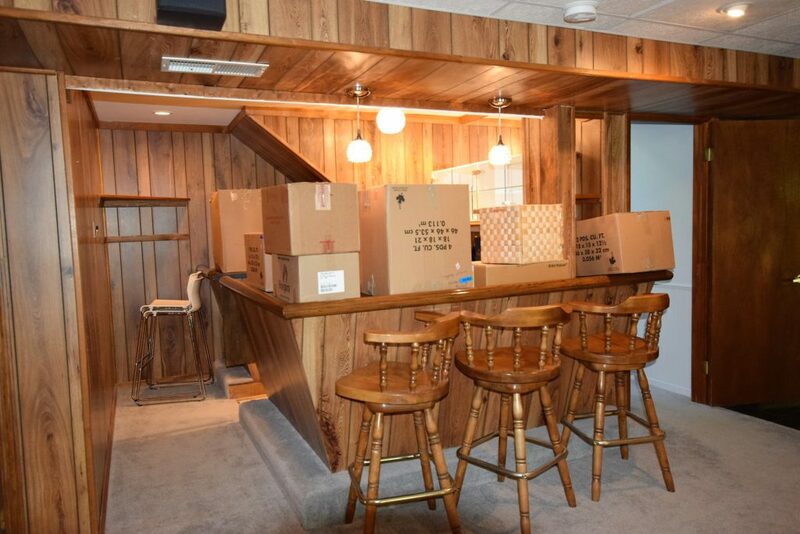 Hopefully we can make the basement feel more like the lower level of the home than a basement so this setup won’t seem so bizarre. The stairs lead to the main living space which also shares space with a built in bar. 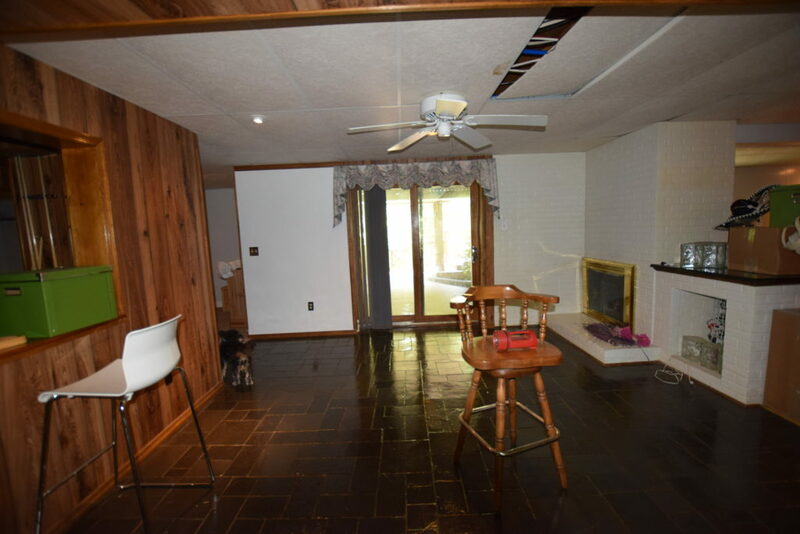 There is an interesting 3-sided box window (like a bay window but with 90 degree angles) that has a small seat area with awesome vinyl tile on the top. 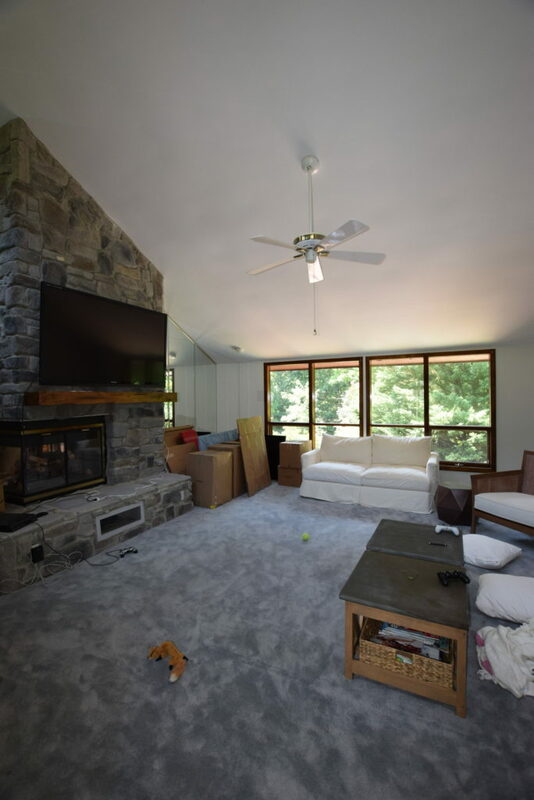 This room also has a 2 sided fireplace and like most of the basement, a drop ceiling. 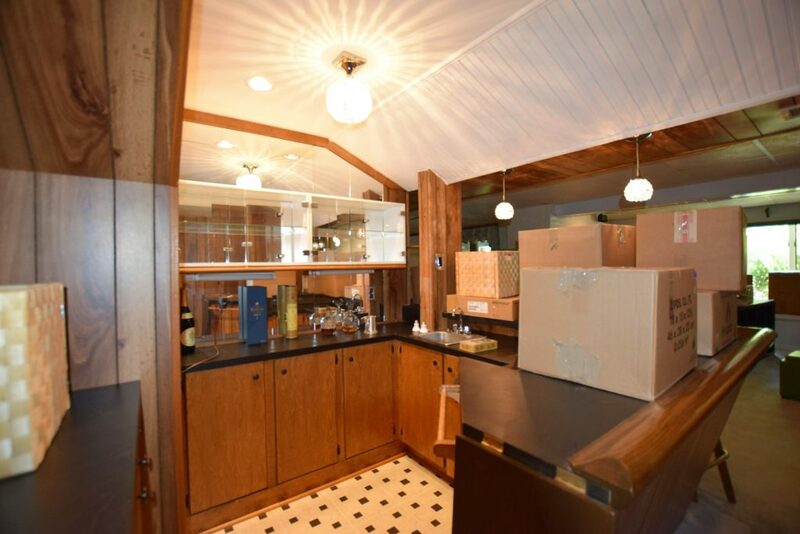 The bar area looks straight out of the 70’s with wood paneling, linoleum flooring and lots of mirrors. The bar’s saving grace are the pendant light fixtures which are actually kinda cute. 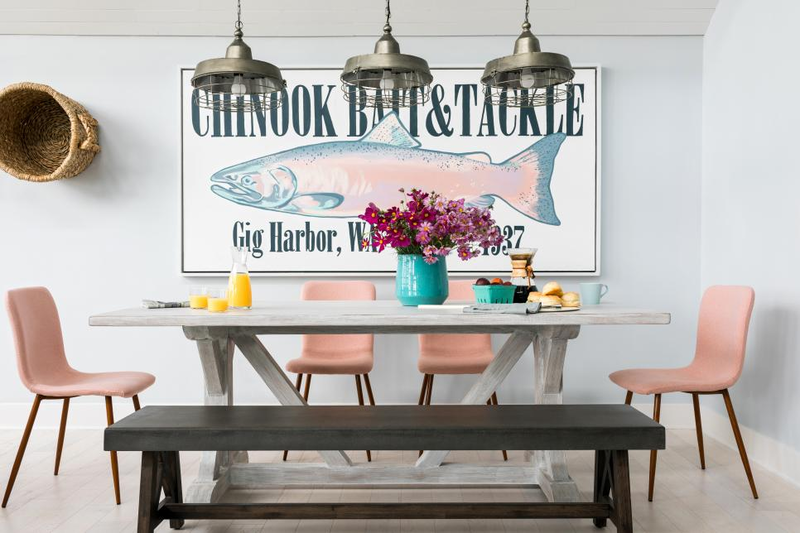 Mind you, they neither go with the wood paneling nor are they my taste nor will they coordinate with the future style of the home, but they are sweet little fixtures. Around the corner from the bar is a wide hallway which houses the utility room hidden behind sliding mirrored doors. 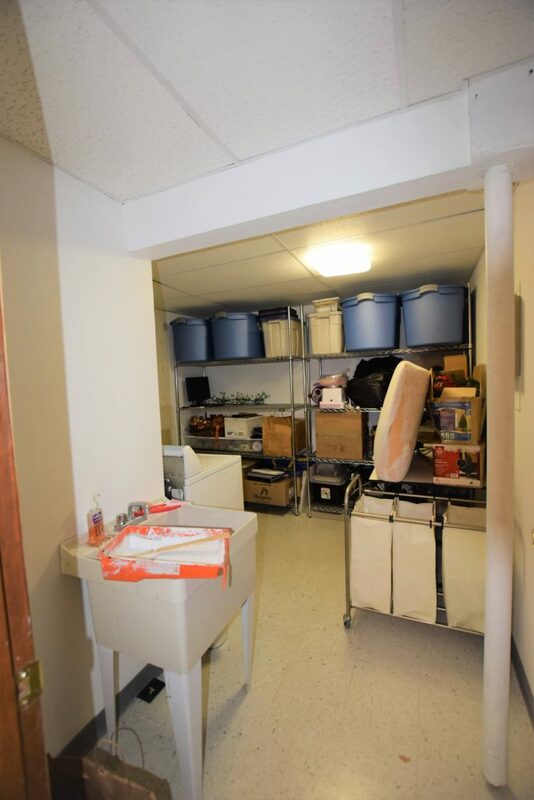 There is a very small room on the right that was at one point a home office. I know I won’t be able to use it as my home office because there are no windows. 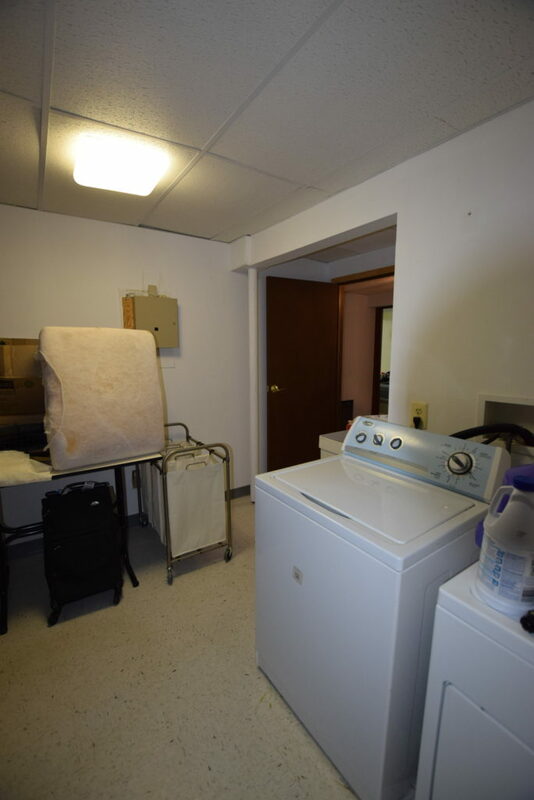 The current laundry room is also off the hallway and doubles as a storage room. The utility sink got a quick facelift this week with leftover Rustoleum Tub and Tile paint (more in a future post) and the washer and dryer will eventually be moved upstairs to the mudroom. There is a small bathroom at the end of the hall. Oh, how I wish it was closer to the exterior door to service the pool! We can at least work on updating the finishes and fixtures. We’ll also look for a way to rearrange the shower since there is a large HVAC soffit running right over the shower head. This shower is for short people only! 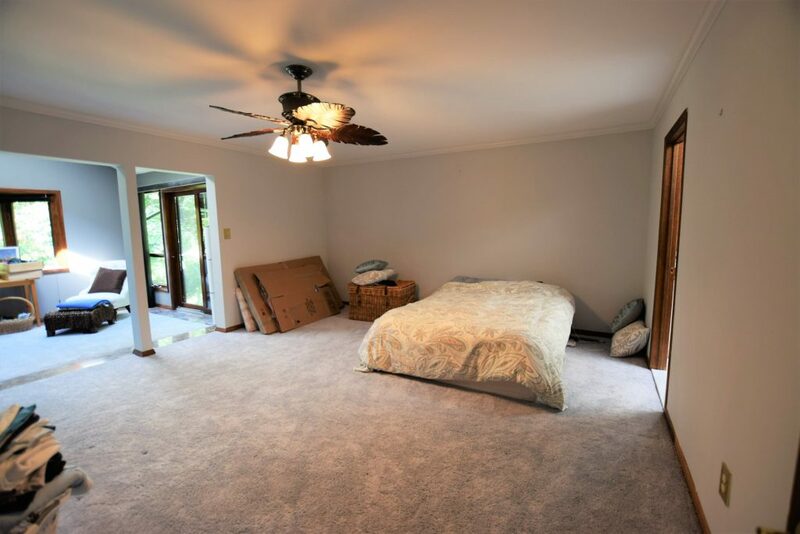 Two bedrooms at this end of the home have flowered wallpaper, mirrored closet doors and carpet. However, to their credit, they each have a full-size window overlooking the pool and patio and a real drywall ceiling. I can’t believe I am getting excited by drywall ceilings. 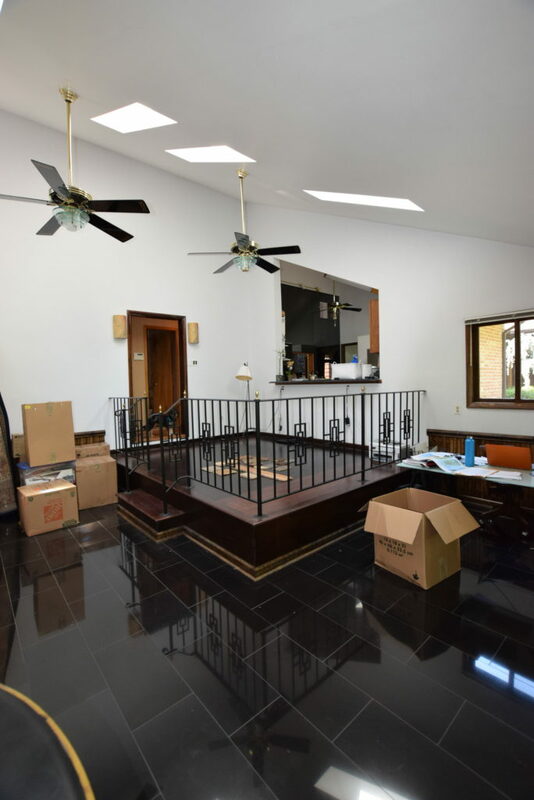 An awkward large foyer-ish space with sliding doors that lead outside to the back yard is on the opposite side of the steps leading upstairs. 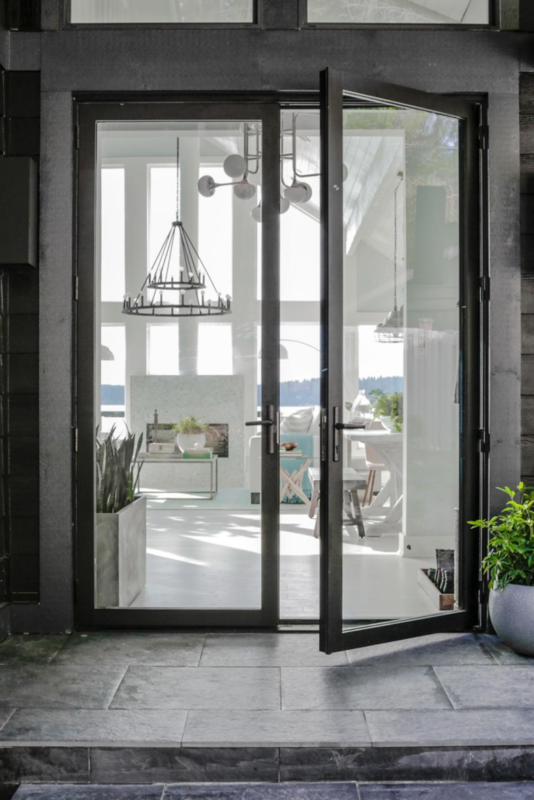 Even with the large doors this portion of the basement is still very dark because the adjacent exterior is covered by a deck. Adding to the darkness is a deep grey slate floor, which doesn’t sound that bad, right? Buuuuut, it’s bad. It’s bad because the slate is coated in some sort of high gloss impervious sheen. I don’t know why anyone would do this to an otherwise perfectly good slate, but it is what it is, and therefore it will change. Note the chair underneath the askew ceiling tile is where we found another leak in the house. The small gym is located just behind the foyer area. It is covered from top to bottom in mirrors. Big mirrors, little mirrors, rectangles, squares and cracked. 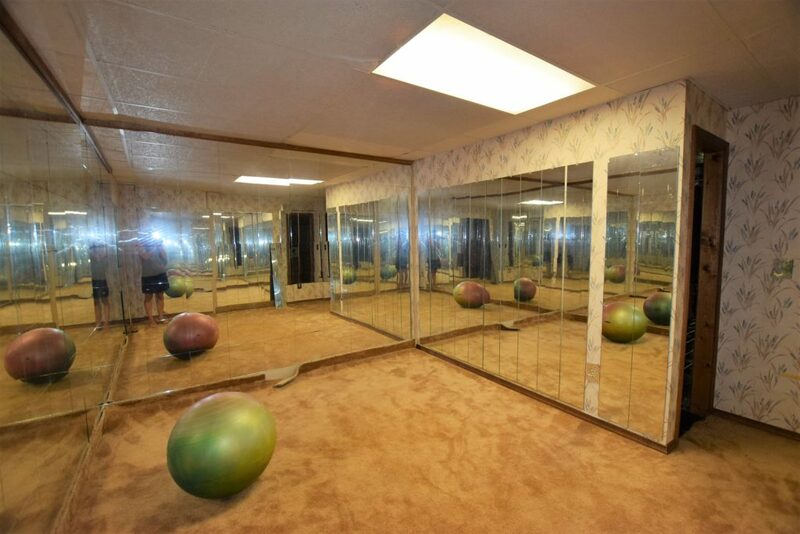 I don’t know how anyone worked out in there without getting vertigo from all the mirrored surfaces and mirror seams that weren’t lined up perfectly. It also has awesome fluorescent lighting so of course you’ll look great as you gaze into those mirrors. We would like to have a home gym but we may borrow some space from the shiny slate area and we will certainly redo the mirrored walls. 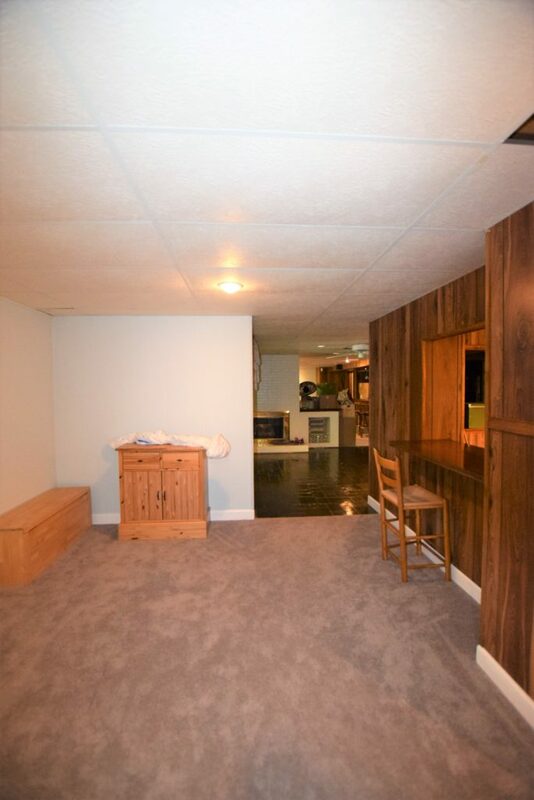 To the left of the basement foyer are 2 final rooms, one with a window that looks out to the defunct hot tub. We’re not sure what this room will be used for just yet, but are considering adding a bigger window or more doors to let additional light in. 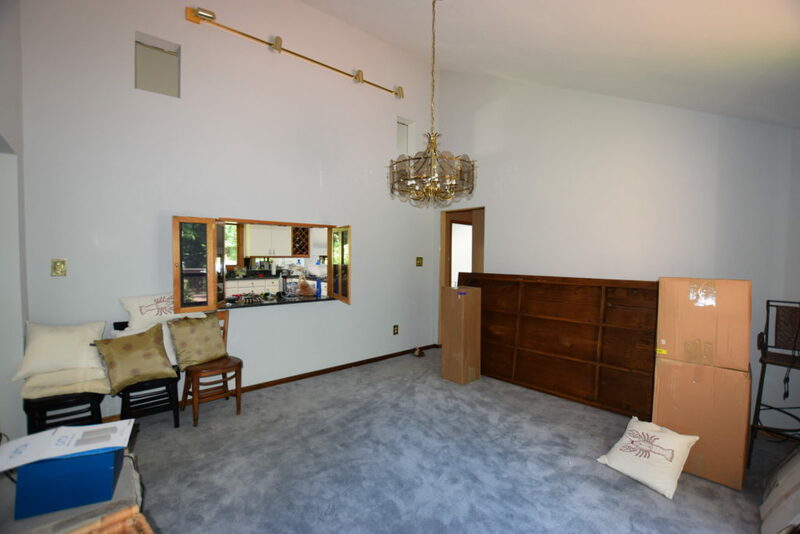 Just adjacent to this room is a nicely tiled room with some strange wood paneled pillars and half walls. 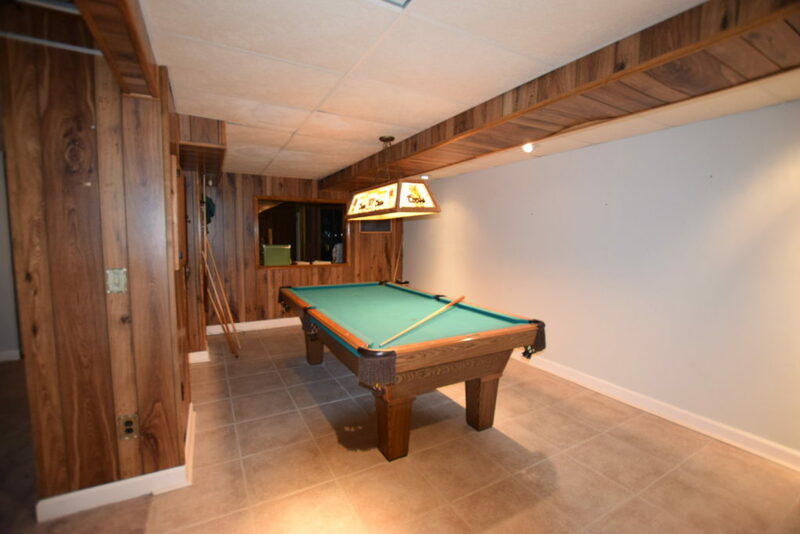 This room is home to the pool table and the coordinating Coors beer pool table light. 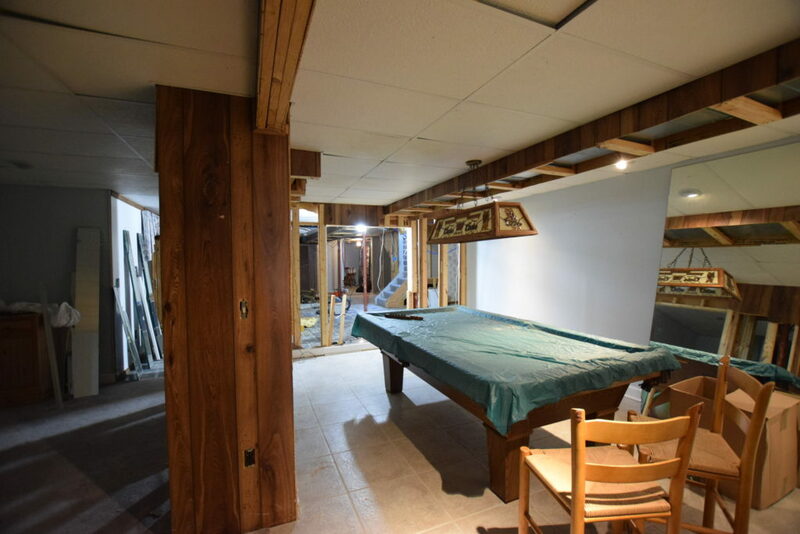 This area will remain a pool and game room but will see some upgrades in wall-covering, ceilings, and lighting. Phew! I think that about covers it for the basement area. Check back next week or a picture tour of the home’s property which is the REAL reason we bought this house. Well, we did it. This is either the stupidest thing we’ve ever done or the most brilliant. I’m talking about our decision to buy a new house. A house that, for us, was pretty expensive, and yet still required work. After 5 days post move in I was convinced that it was a dumb idea. We had already found 3 leaks and evidence of a mouse infestation. 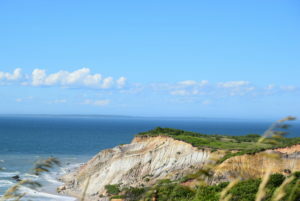 I was probably just tired and overwhelmed from all the hassle and chaos of moving and I wasn’t seeing the big picture. 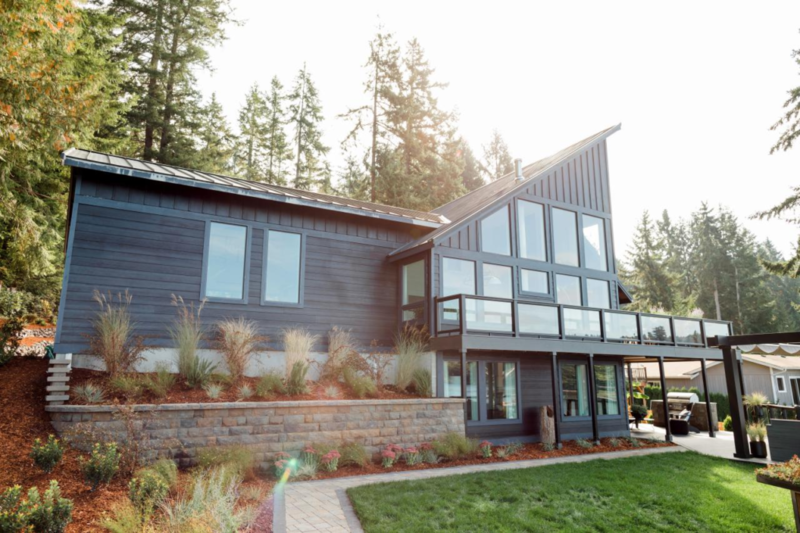 The bigger picture is that this house is huge, about 5200 square feet. It has all the things we wanted, a pool, a 3-car garage, was in our kids current school boundary, and most importantly, it had space. Wonderful, glorious space. 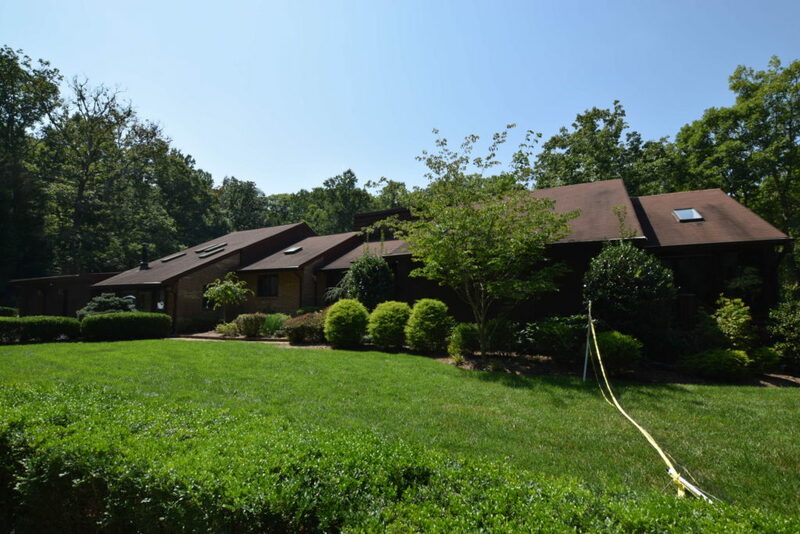 I could stretch my arms out wide at our last house and touch both my and my neighbor’s home, so this new house on 5 acres, just outside of Washington DC, is a rarity and a real treat. Sure, everything has its cost, and in this case getting what we wanted was going to cost us both monetarily and with the promise of investing time and sweat equity. So now, after being in the house for just over a week, and already starting a few small projects, and in the midst of unpacking I’m feeling better about our decision. Welcome to my major project, my new home! 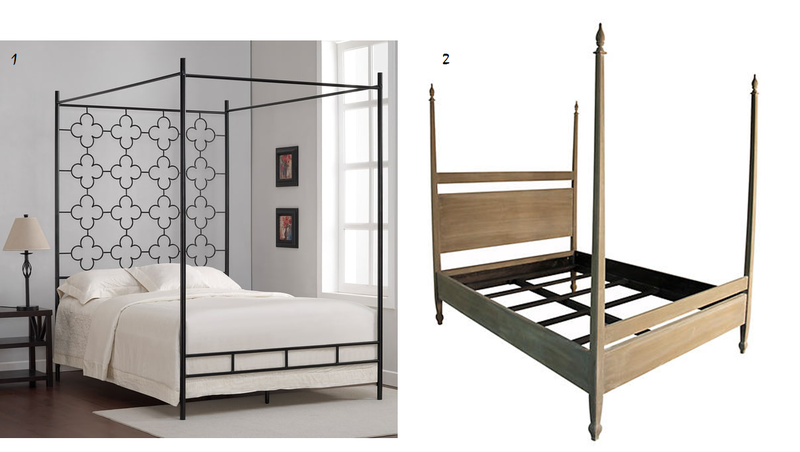 My hope is to be able to document the renovation on the blog from start to finish. 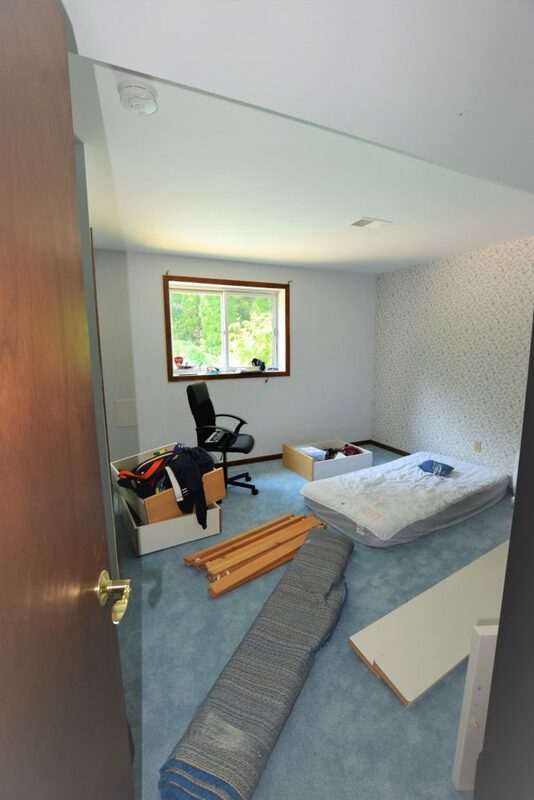 So first, I guess it’d be smart to show you some “before” pics and describe the place. Warning, these pics (namely the interior) show unadulterated moving mess and chaos. 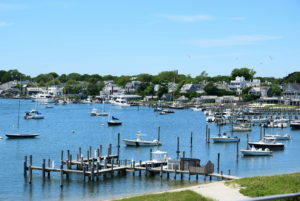 Real estate is all about location, location, location, right? 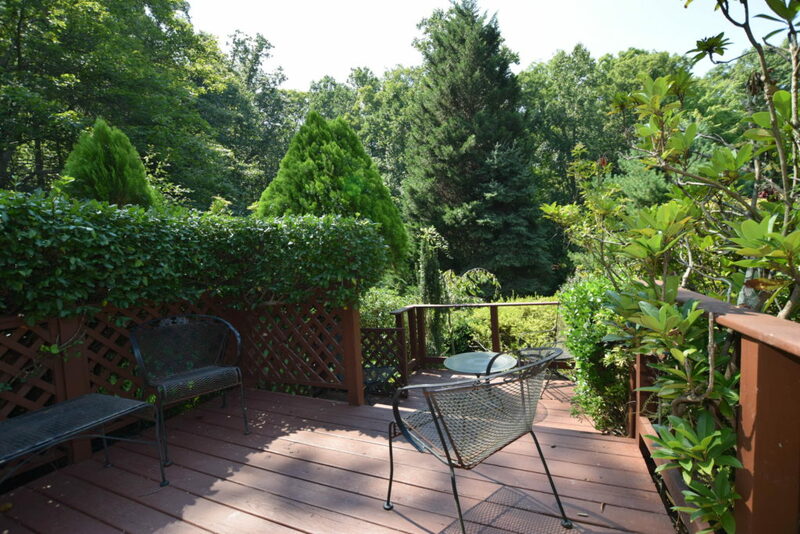 This house is in Fairfax County, VA. Close enough to commute to downtown DC for work every day, some of the best schools in the country, and quintessential suburbia. 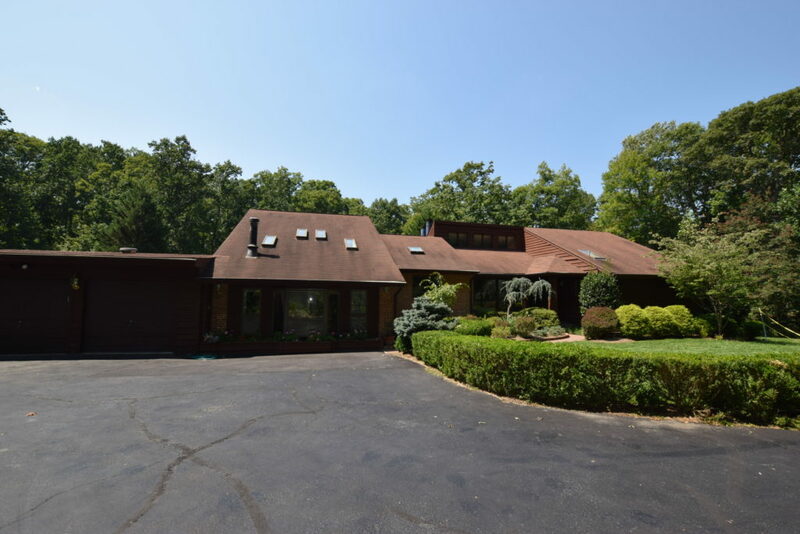 Except this house is nestled in the woods on one of the few remaining 5+ acre lots in the county. 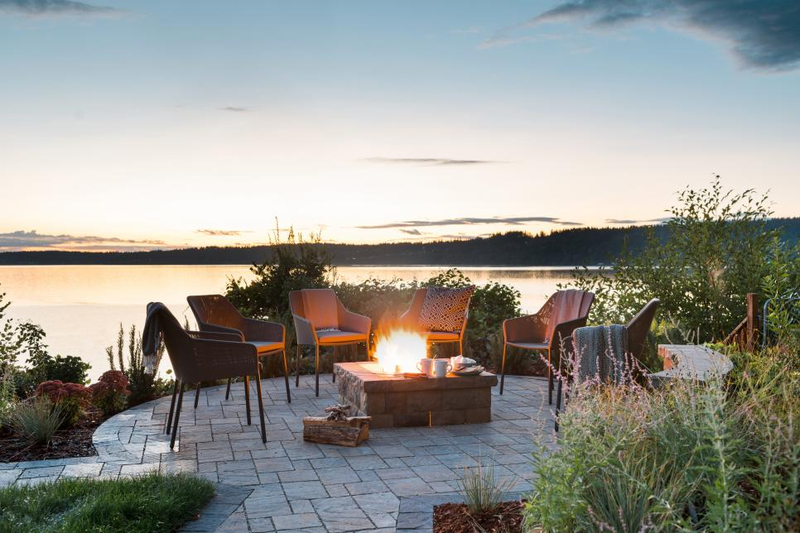 The location is about as close to perfection as we could get. 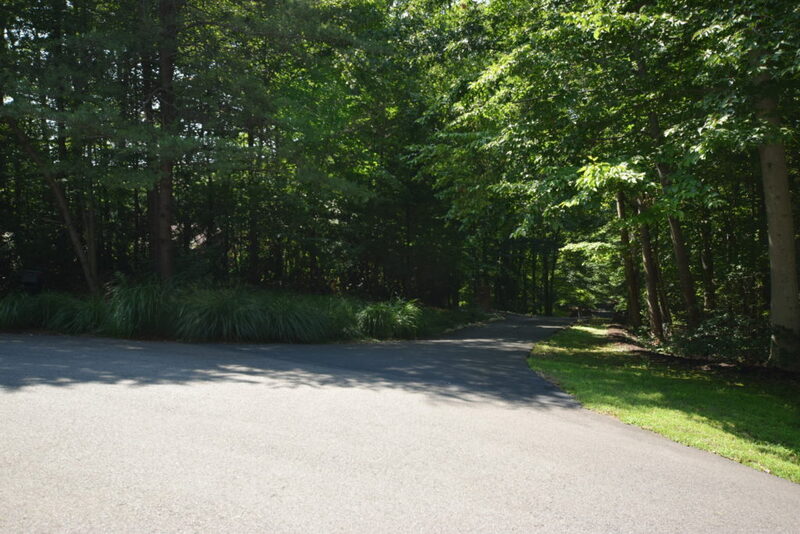 The lot is at the end of a cul de sac on a private drive. It’s so nestled in the woods that you can’t even see the house from the street. 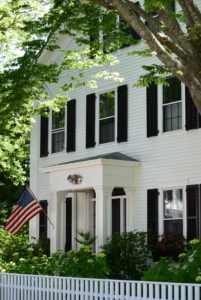 The house style is a 1980’s contemporary. 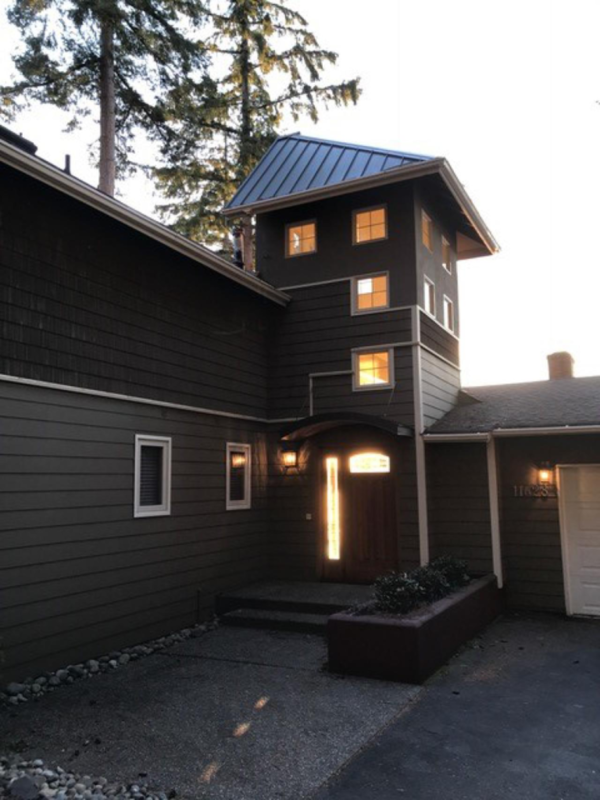 It’s got a long and rambling floorplan that contains one main living level and a walkout basement level. 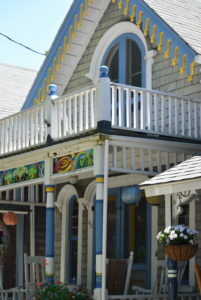 The current style, both inside and out could most politely be described as “retro”. 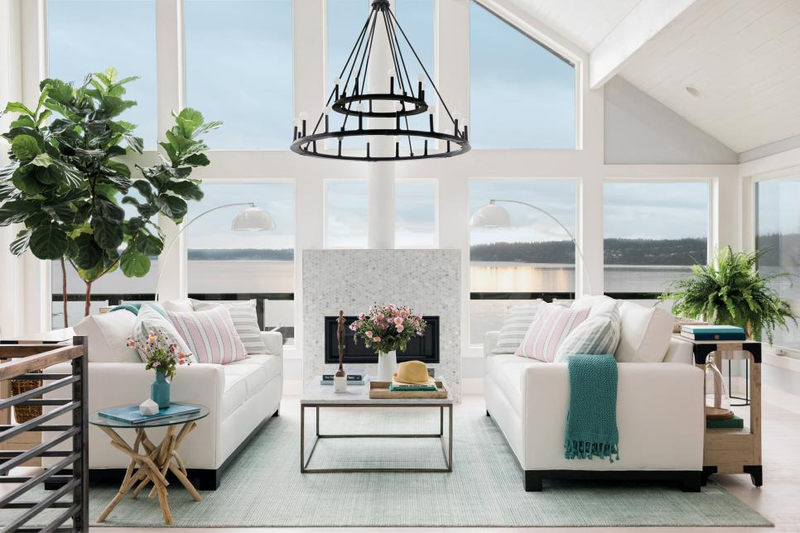 I’m pretty excited to venture into designing a contemporary home since almost every project in this area is traditional, colonial, or coastal. This will be a great change of pace and a bit of a challenge for me design wise, but I’m up for it! 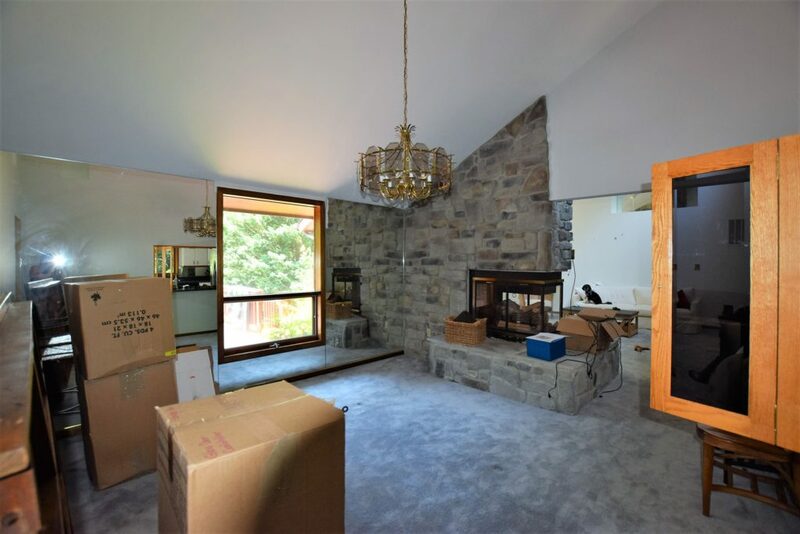 The foyer is large, has lots of good light from the front windows, some crystal and gold chandeliers that aren’t my bag and frankly don’t go with the home. 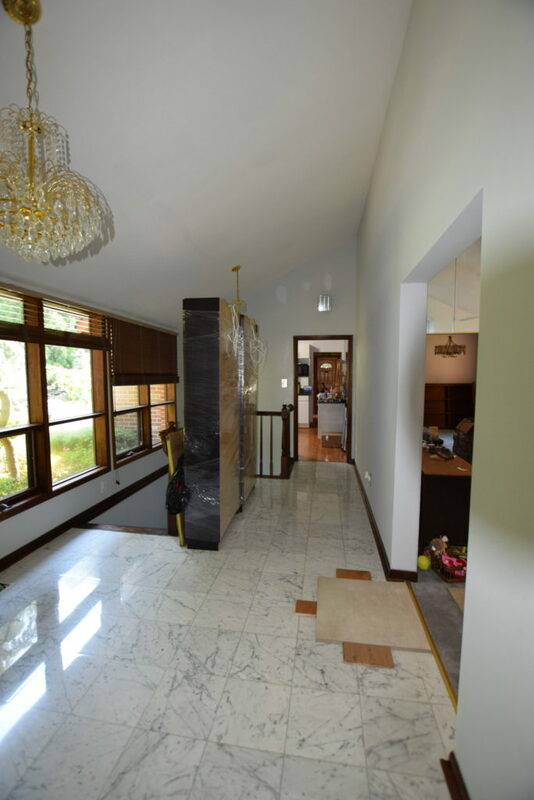 The flooring is a glossy Carrera marble tile, which isn’t bad, but several tiles are cracked. 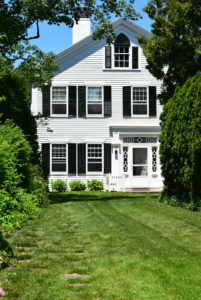 The foyer is the central hub with stairs leading to the basement (and a very traditional style railing), forward to the living room, left to the kitchen and right to the two main floor bedrooms. Yep, new flooring samples are scattered on the floor presently. The living room is huge. Everything in it looks huge. 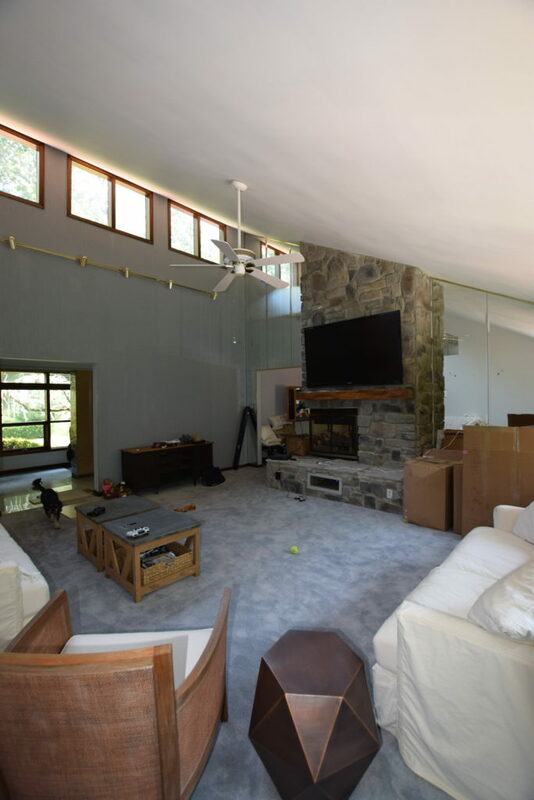 Big wood picture windows with casement bottoms, vaulted ceiling to probably about 20 feet high, massive stone fireplace and the first appearance of the omnipresent mirrors. I haven’t counted, but this house is like a funhouse. There are mirrors everywhere you turn. Full wall mirrors, cutout mirrors, tiled mirrors, mirrors on top of mirrors. The living room also boasts the spongiest carpet I have ever felt. My daughter has taken to practicing cartwheels here because it’s just like a gymnastic floor. The dining room is connected to the living room and shares the fireplace wall. There is a smaller window overlooking the back yard, flanked by, yes, more mirrors, and a fun little drive through opening to the kitchen. And by fun, I mean for my 10 year old self when I used to dream of working the drive through at McDonald’s (talk about #goals). The dining room also has a chandelier very typical for the 1980’s, bright brass and faceted glass panels. The adjoining kitchen is small by today’s standards. 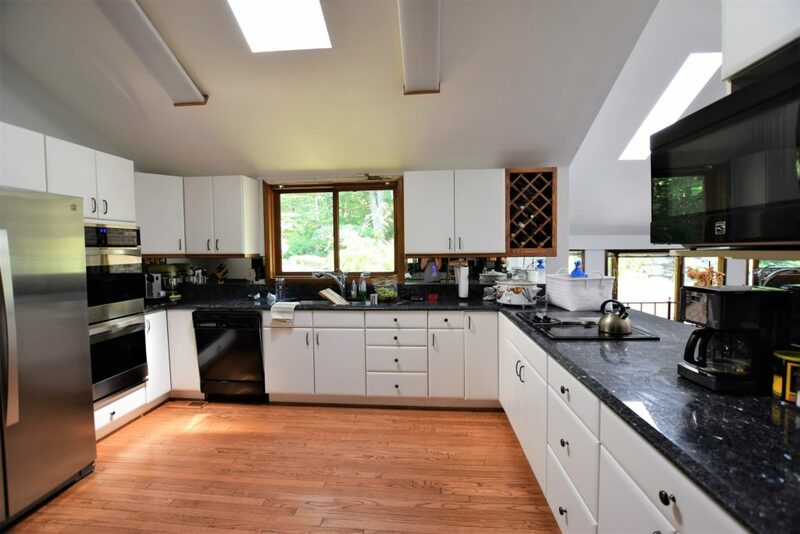 The dated white cabinets, oak flooring, leaky skylight, unintentionally retro ceiling fan, fluorescent lighting and a wall of black mirrored glass are all the things that need to change. 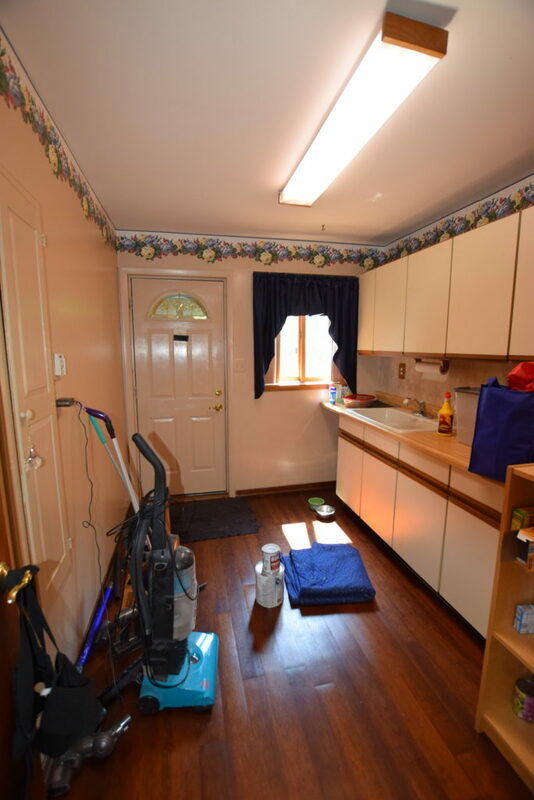 To its benefit it does have nice granite counters and an updated fridge and wall ovens. The ancient ceramic cook top and mismatched dishwasher are also less than ideal. 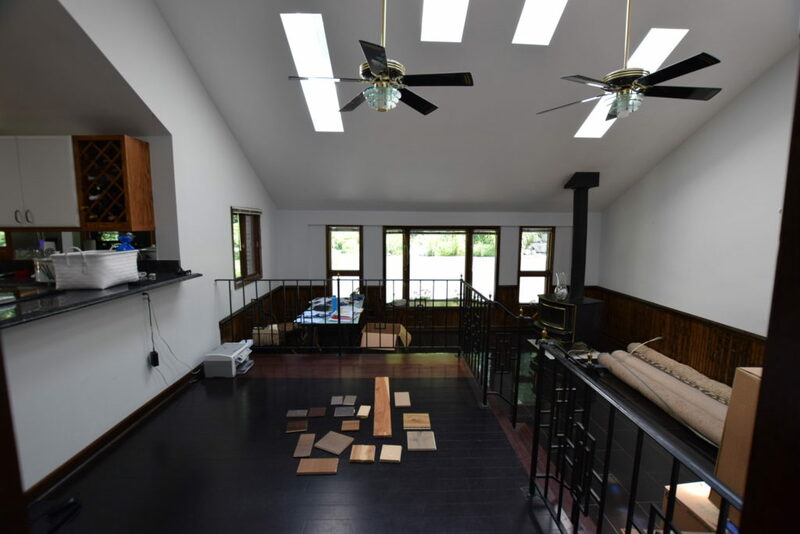 The hall next to the kitchen leads to another room with a raised platform that forms a bar to the kitchen cutout, but this platform makes the rest of the space in the room awkward and unusable. This room, which probably served as a family room, breakfast room has 3 different floors, black bamboo, red bamboo and glossy black granite. 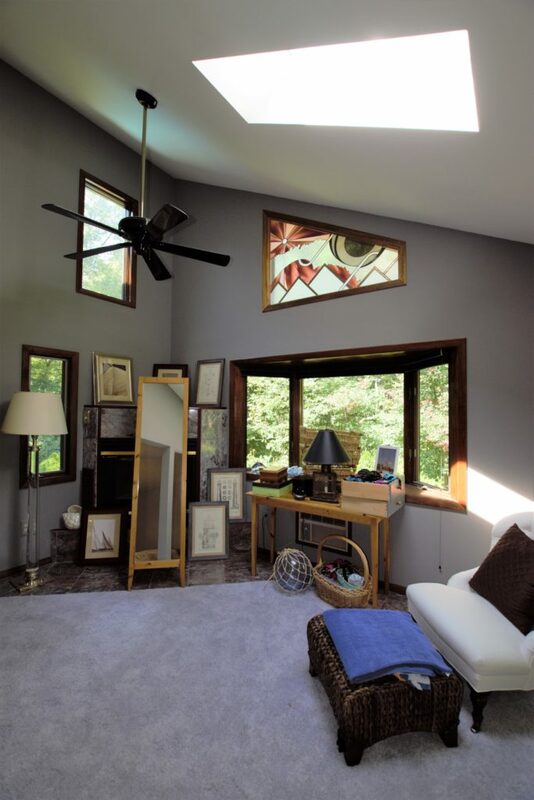 The vaulted ceiling is nice as are the skylights and the large front windows. 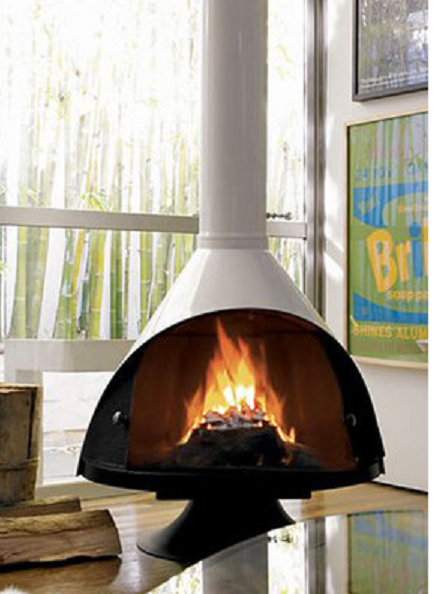 We hope the woodburning stove will help with energy efficiency this winter. This room actually used to be a garage so when it was converted to living space room was “taken” for the electrical panels by building a awkward closet. The home has a number of electrical issues so as we fix them we’ll probably also relocate these panels since their current set-up is neither to code nor aesthetically pleasing. 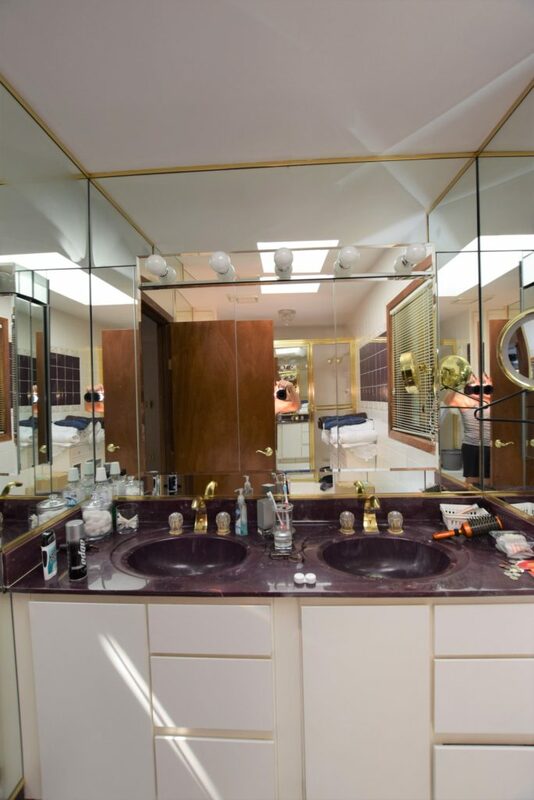 Across the hall from the family room is a powder room, with floor to ceiling travertine tile, dated sink cabinet and lighting and a toilet complete with a wooden toilet seat. 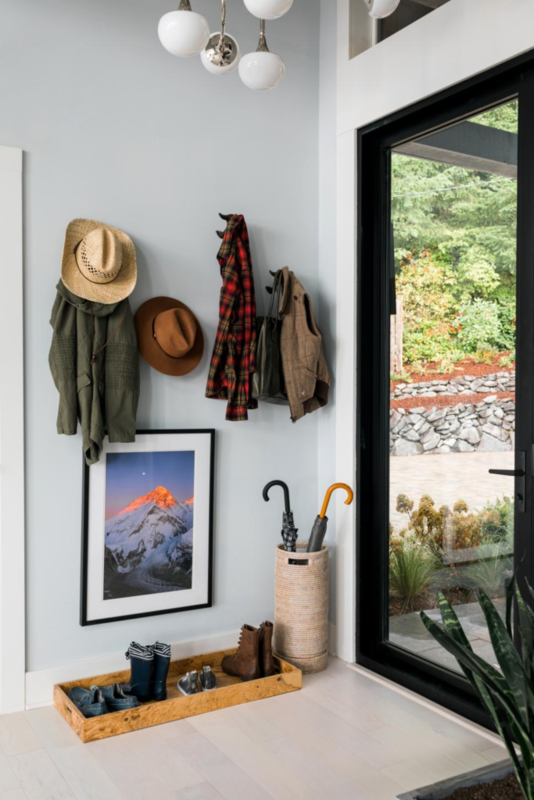 Next to the powder room is one of my favorite rooms in the house… well not in its current state… but I’ve been wanting a mudroom forever. Eventually this will be a mudroom/ laundry room with extra pantry style storage. The final room on this side of the house is yet another living room type space, which we’ll call a den since we’ve already got a living room and a family room. Our hope is to not call it a den for long, we’d love to convert this room to the kitchen to maximize easy access to the back decks and the overall larger space. We’ll know this Friday when we meet with a structural engineer to tell us if these dreams can come true since some adjoining walls would need to come down and we’d want to vault this ceiling as well. Across the other side of this level is the bedroom wing. The hallway has a coat closet (with mirrored doors of course) and leads to a bathroom and our daughter’s room. The bathroom isn’t too bad. 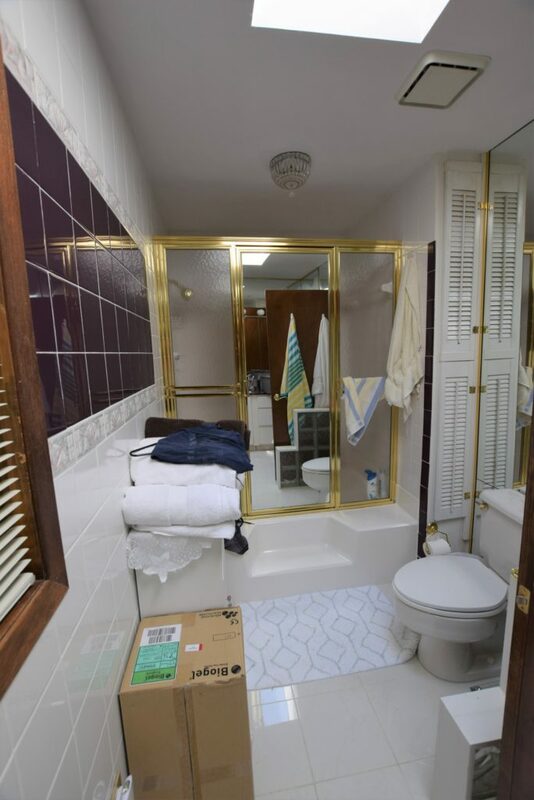 Sure it’s got a grey toilet and tub, 4 different kinds of tile (to the ceiling no less), a worn vanity, dated lighting, a mirrored medicine cabinet on top of a wall mirror, old brass fixtures and a brass and glass shower enclosure. While we await for approval to knock down walls, I’ve taken on this bathroom and the nearby linen closet as my first pet projects. I’ll detail more in a future blog post so you can see my low-budget reno on this bathroom. 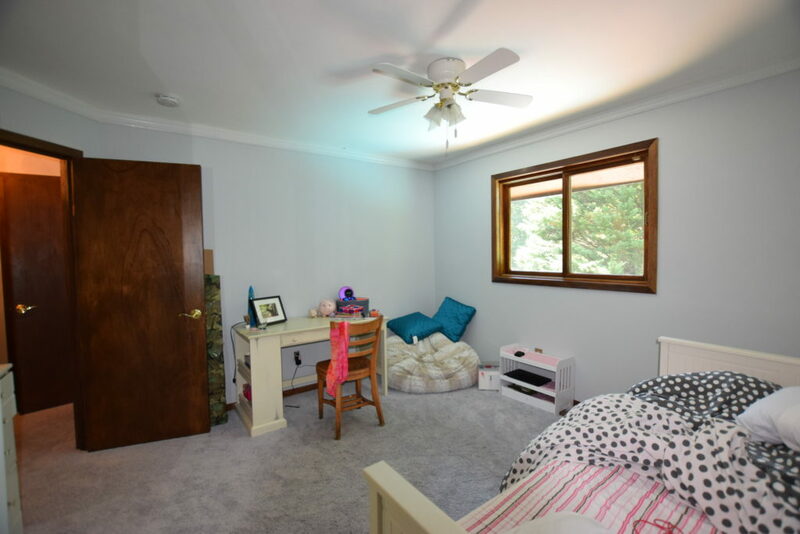 The 1st bedroom off the hall is my daughter’s and it’s a pretty standard bedroom. Smaller than her last but it overlooks the pool. 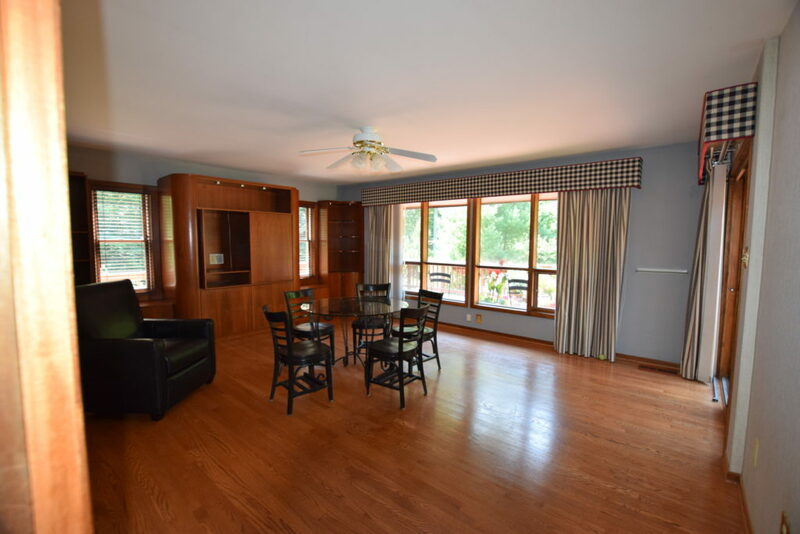 We’ll eventually update it by replacing the traditional trim with something more contemporary, replace carpet with hardwood, new closet doors and paint. Pretty simple, right? Finally, the master suite. 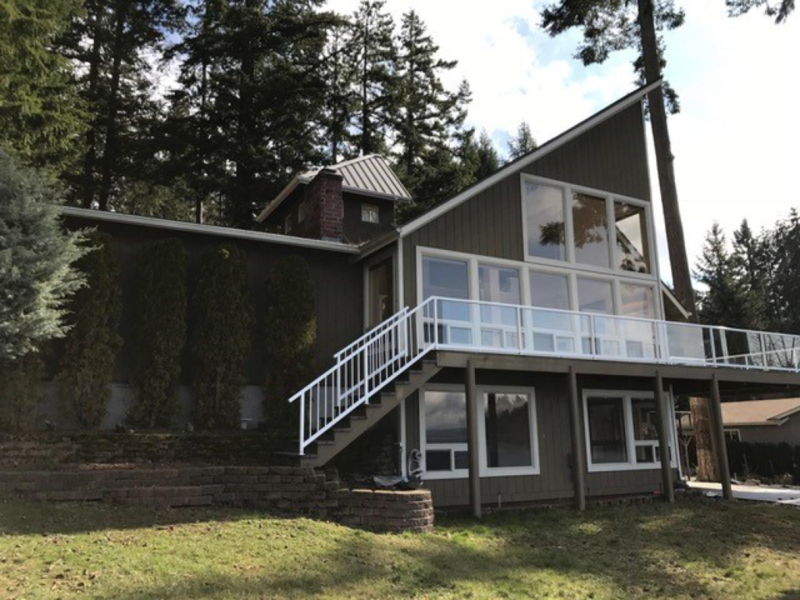 It’s huge, thanks in part to an addition in which the previous owners added a room on top of an existing deck. 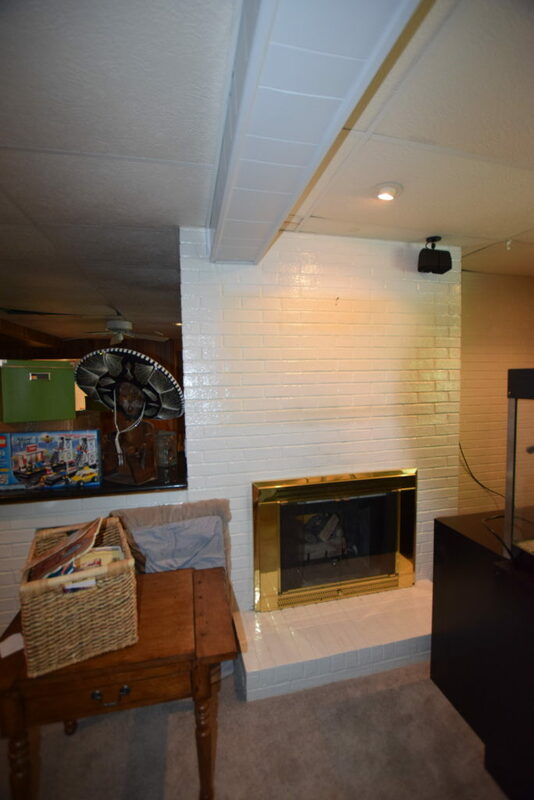 However, this room currently seems to slope downward and features a gas fireplace that doesn’t seem to work, and burgundy and grey tile that is popping up unprovoked. 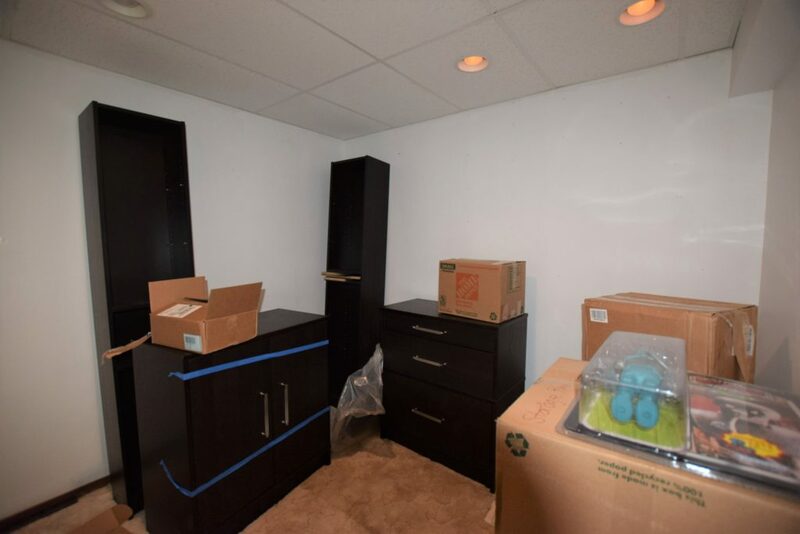 It’s a good thing that this space is so large because we will need to borrow some space to make the master bathroom larger. 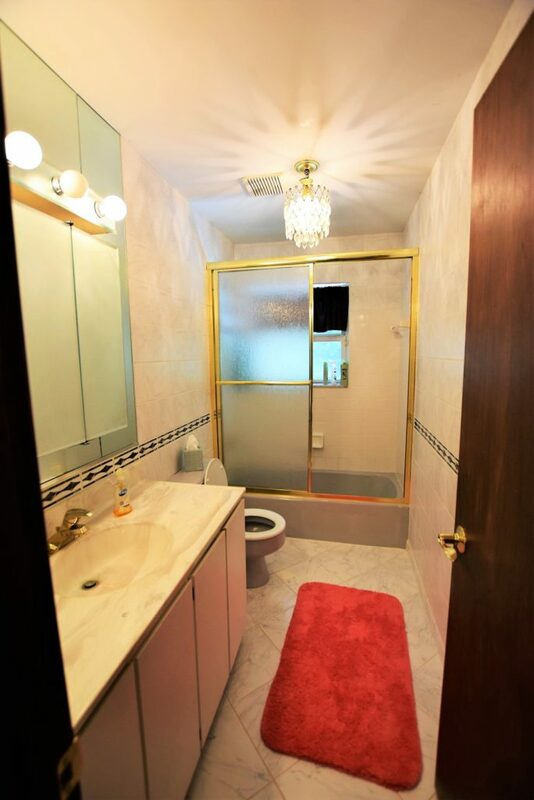 The bath currently has gold framed shower doors, mirrors everywhere, some glass block and a plum purple sink and coordinating 80’s era tile on the walls. That’s all for today, over the coming days I’ll take you on a tour of the basement and our favorite part of this property and the real reason we bought it, the outdoors. 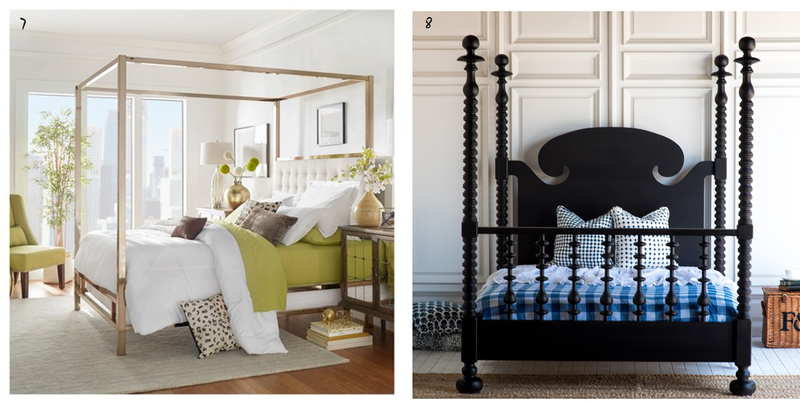 Of course if you have great design recommendations, put them in the comments and share with your friends and family! Ugggh. I am so guilty and feel terrible that I haven’t created a blog post in such a long time! Sorry! It all started back in early June. First my husband was surprised to find out that the Army was promoting him. So planning for a ceremony and party occupied a bit of our free time, then on top of that excitement we decided to make an offer on a house we liked, which ultimately resulted in us having to get our house ready to put on the market, an offer from the military to move to Italy (which we ultimately turned down), and celebrating my son’s graduation from 8th grade, and both my husband and my birthdays within 2 days of each other…. June was a whirlwind and July hasn’t been much better. Thankfully there was 4 days of respite amongst all of it. 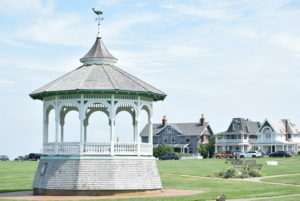 My husband surprised me with a trip to Martha’s Vineyard for my 40th birthday! 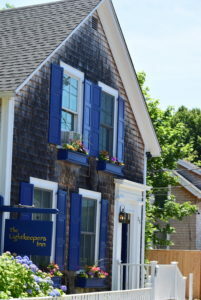 I had never been there but had read several books that are set in the relaxed, upscale, posh island. 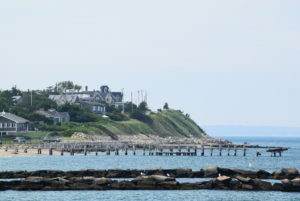 Besides spending some time lying on a beach I was most looking forward to perusing the streets taking in all the great shingle clad architecture. Martha did not disappoint! Architecture ogling started as soon as our little plane touched down. 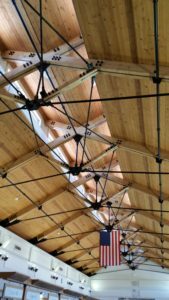 The airport with its whitewalls natural wood shiplap ceiling, detailed beams complete with turnbuckles offered a worthy welcome to this picturesque little island. 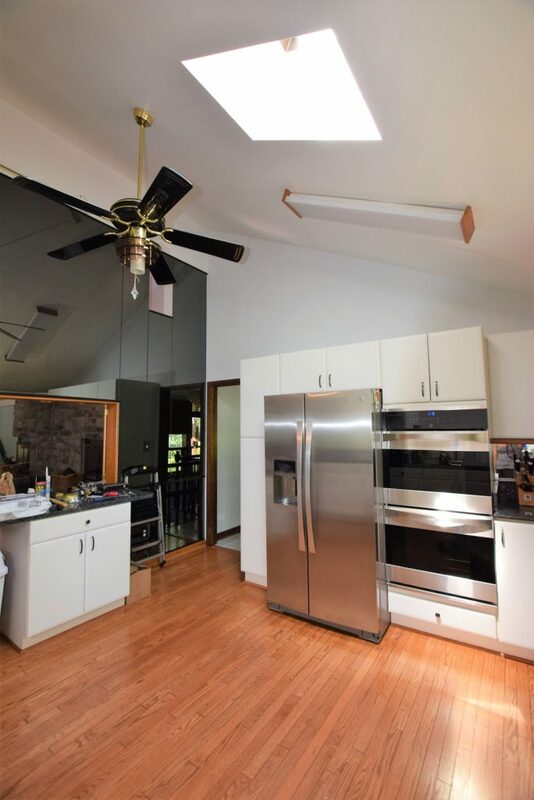 Check out those beams! 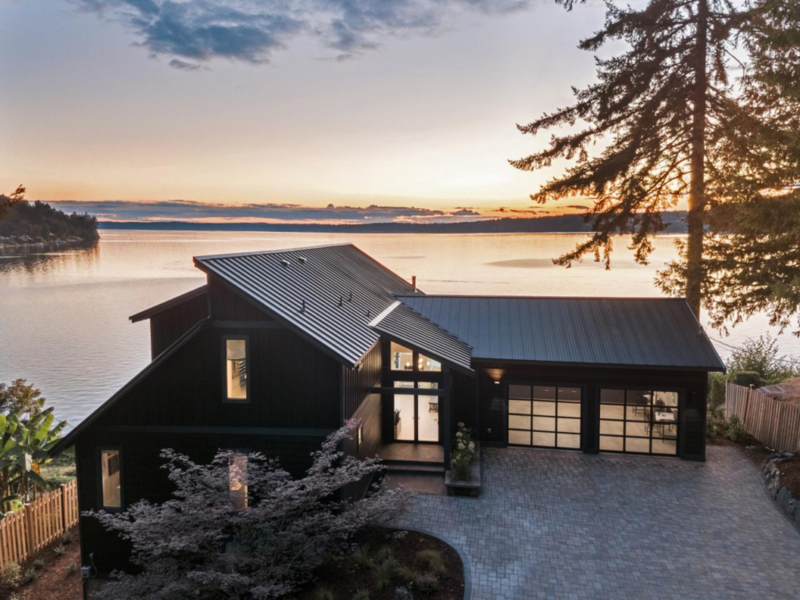 I really expected to see more grand homes with lots of weathered gray cedar shake siding, and while those did exist I think some of the large compounds were tucked away in the meandering woods of the island so their residents can enjoy privacy. I was so surprised to find lane upon lane of adorable little Victorians dripping in gingerbread details. 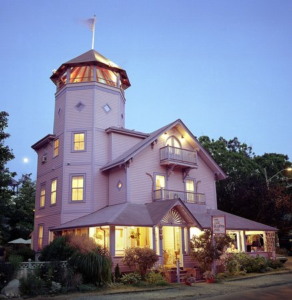 The first sample of vintage Victorian architecture was our little B&B, the Oak Bluffs Inn. 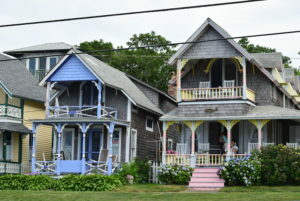 Painted in pretty pastel shades of blue, lavender and pink it was a quintessential Victorian with seashore inspired antiques decorating the inside. 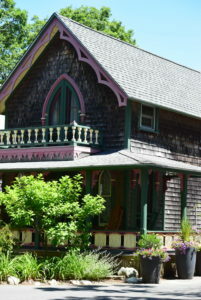 Our little cottage was a separate building in the back yard and was simply appointed and perfect for relaxing. Very private and no TV. A few blocks over the Victorian delight continued with tons of shaded streets lined with adorable doll house like seasonal residences. 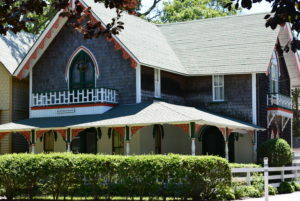 The area known as the Martha’s Vineyard Camp Meeting Association (MVCMA) is a community ripe with adorable Victorian homes in every color of the rainbow. 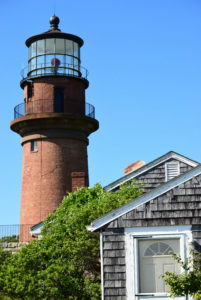 And yes, the parks, beaches, and lighthouses were gorgeous and every meal we had was excellent – so many great restaurants to choose from. 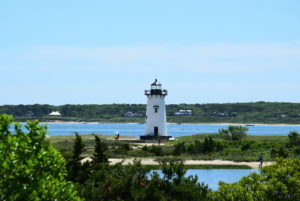 I’d go back to Martha’s Vineyard in a heartbeat. Alas a return trip will have to wait because, fingers crossed, if everything goes well in the next month or so we’ll be moving! Stay tuned! In the meantime, amidst purging and packing I promise to be better about blogging regularly and will share some highlights and ideas from some of my recent clients and moving tips too! It’s been a while since I posted a fashion oriented post, I’ve been busy. It seems like every time I turn around there is another event to either plan or attend this summer. The kids are wrapping up school, warm weather is here and folks just wanna get together and have fun. 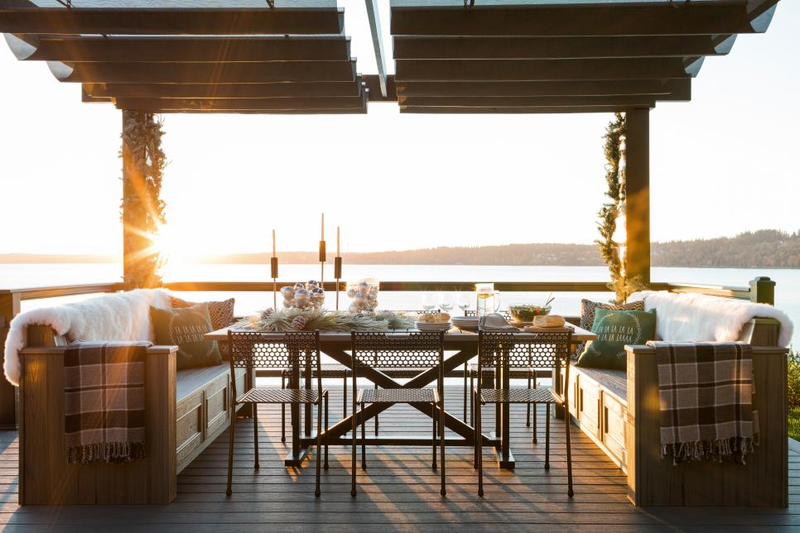 Summer events are even more enjoyable if you look and feel great at all of those June weddings, graduations, birthdays and evenings on the town. True, there is a time and a place when it doesn’t matter if fashion is comfortable or not, but when it’s hot and sticky outside you just want to be cool, comfortable and collected. 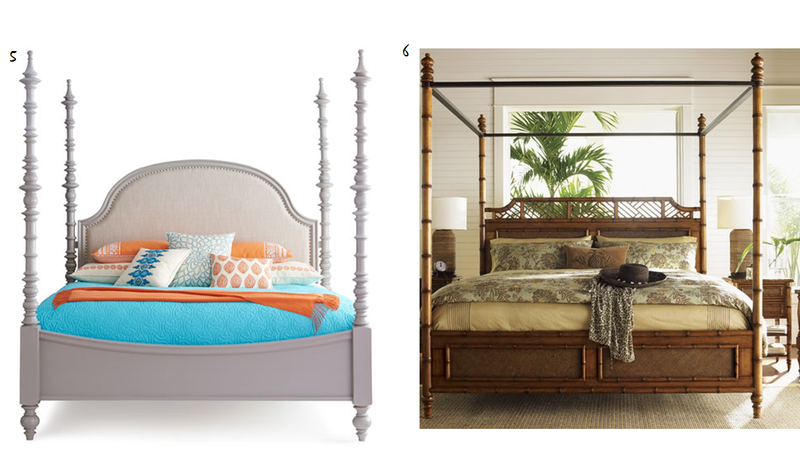 Here are a few of my favorite staples for easy summer event style. First Up, the cotton maxi dress. You can’t get much more comfortable than something that feels like you’re in cotton PJs. These are so versatile, you can dress them up for a party with strappy heels and some bold jewelry or tone them down with flip flops and a straw hat for the beach. I am loving the olive green on the first one. Olive and white are my favorite summer clothing colors because they look phenomenal with a tan (and I happen to be one of those awful people that tans easily, even under a coat of sunscreen… don’t hate me). Next, the summer night out / wedding appropriate short dress. The more casual polka dot Banana Republic number would be perfect for an evening barbeque while the black off the shoulder dress is fitting for a hot date. While socially acceptable to pair a nice dress with bare toes at the beach or even at a pool party, virtually everywhere else it’s a faux pas. Here’s a selection of adorable heel sandals that could pair with a number of the dress selections above. And while we’re at it why not add a few more necessary essentials. 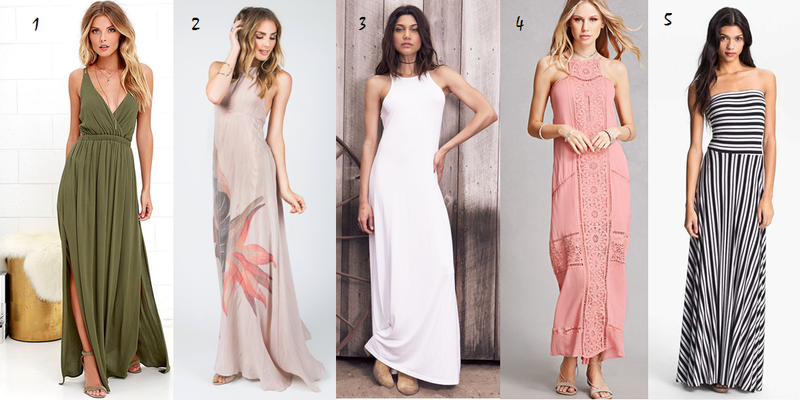 Pick one or two of these to complete the perfect summer event look.